This article is about Jesus of Nazareth. For other uses, see Jesus (disambiguation). "Christ" redirects here. For other uses, see Christ (disambiguation). "Jesus of Nazareth" redirects here. For other uses, see Jesus of Nazareth (disambiguation). Jesus[e] (c. 4 BC – c. AD 30 / 33), also referred to as Jesus of Nazareth and Jesus Christ,[f] was a first-century Jewish preacher and religious leader. He is the central figure of Christianity, and is widely described as the most influential person in history. Most Christians believe he is the incarnation of God the Son and the awaited Messiah (Christ) prophesied in the Old Testament. Virtually all modern scholars of antiquity agree that Jesus existed historically,[g] although the quest for the historical Jesus has produced little agreement on the historical reliability of the Gospels and on how closely the Jesus portrayed in the Bible reflects the historical Jesus. [h][i] Jesus was a Galilean Jew who was baptized by John the Baptist and began his own ministry. He preached orally and was often referred to as "rabbi". Jesus debated with fellow Jews on how to best follow God, engaged in healings, taught in parables and gathered followers. He was arrested and tried by the Jewish authorities, turned over to the Roman government, and crucified on the order of Pontius Pilate, the Roman prefect. After his death, his followers believed he rose from the dead, and the community they formed eventually became the early Church. Christian doctrines include the beliefs that Jesus was conceived by the Holy Spirit, was born of a virgin named Mary, performed miracles, founded the Christian Church, died by crucifixion as a sacrifice to achieve atonement for sin, rose from the dead, and ascended into Heaven, from where he will return. Most Christians believe Jesus enables people to be reconciled to God. The Nicene Creed asserts that Jesus will judge the living and the dead either before or after their bodily resurrection, an event tied to the Second Coming of Jesus in Christian eschatology. The great majority of Christians worship Jesus as the incarnation of God the Son, the second of three persons of the Trinity. A minority of Christian denominations reject Trinitarianism, wholly or partly, as non-scriptural. Jesus also figures in non-Christian religions and new religious movements. In Islam, Jesus (commonly transliterated as Isa) is considered one of God's important prophets and the Messiah. Muslims believe Jesus was a bringer of scripture and was born of a virgin, but was not the son of God. The Quran states that Jesus never claimed divinity. Most Muslims do not believe that he was crucified, but that he was physically raised into Heaven by God. In contrast, Judaism rejects the belief that Jesus was the awaited Messiah, arguing that he did not fulfill Messianic prophecies, and was neither divine nor resurrected. A typical Jew in Jesus' time had only one name, sometimes followed by the phrase "son of <father's name>", or the individual's hometown. Thus, in the New Testament, Jesus is commonly referred to as "Jesus of Nazareth"[k] (e.g., Mark 10:47). Jesus' neighbors in Nazareth refer to him as "the carpenter, the son of Mary and brother of James and Joses and Judas and Simon" (Mark 6:3), "the carpenter's son" (Matthew 13:55), or "Joseph's son" (Luke 4:22). In John, the disciple Philip refers to him as "Jesus son of Joseph from Nazareth" (John 1:45). The name Jesus is derived from the Latin Iesus, a transliteration of the Greek Ἰησοῦς (Iesous). The Greek form is a rendering of the Hebrew ישוע‎ (Yeshua), a variant of the earlier name יהושע‎ (Yehoshua), or in English, "Joshua", meaning "Yah saves". This was also the name of Moses' successor and of a Jewish high priest. The name Yeshua appears to have been in use in Judea at the time of the birth of Jesus. The 1st-century works of historian Flavius Josephus, who wrote in Koine Greek, the same language as that of the New Testament, refer to at least twenty different people with the name Jesus (i.e. Ἰησοῦς). The etymology of Jesus' name in the context of the New Testament is generally given as "Yahweh is salvation". Since early Christianity, Christians have commonly referred to Jesus as "Jesus Christ". The word Christ was a title or office ("the Christ"), not a given name. It derives from the Greek Χριστός (Christos), a translation of the Hebrew mashiakh (משיח) meaning "anointed", and is usually transliterated into English as "Messiah". In biblical Judaism, sacred oil was used to anoint certain exceptionally holy people and objects as part of their religious investiture (see Leviticus 8:10–12 and Exodus 30:29). Christians of the time designated Jesus as "the Christ" because they believed him to be the Messiah, whose arrival is prophesied in the Hebrew Bible and Old Testament. In postbiblical usage, Christ became viewed as a name—one part of "Jesus Christ". The term "Christian" (meaning a follower of Christ) has been in use since the 1st century. Some early Christian groups had separate descriptions of the life and teachings of Jesus that are not included in the New Testament. These include the Gospel of Thomas, Gospel of Peter, and Gospel of Judas, the Apocryphon of James, and many other apocryphal writings. Most scholars conclude that these are written much later and are less reliable accounts than the canonical gospels. The canonical gospels are four accounts, each written by a different author. The authors of the gospels are all anonymous, attributed by tradition to the four evangelists, each with close ties to Jesus: Mark by John Mark, an associate of Peter; Matthew by one of Jesus' disciples; Luke by a companion of Paul mentioned in a few epistles; and John by another of Jesus' disciples, the "beloved disciple". One important aspect of the study of the gospels is the literary genre under which they fall. Genre "is a key convention guiding both the composition and the interpretation of writings". Whether the gospel authors set out to write novels, myths, histories, or biographies has a tremendous impact on how they ought to be interpreted. Some recent studies suggest that the genre of the gospels ought to be situated within the realm of ancient biography. Although not without critics, the position that the gospels are a type of ancient biography is the consensus among scholars today. Not everything contained in the New Testament gospels is considered to be historically reliable. Views range from their being inerrant descriptions of the life of Jesus to their providing little historical information about his life beyond the basics. According to a broad scholarly consensus, the Synoptic Gospels (Matthew, Mark, and Luke), and not John, are the most reliable sources of information about Jesus. According to the Marcan priority, the first to be written was the Gospel of Mark (written AD 60–75), followed by the Gospel of Matthew (AD 65–85), the Gospel of Luke (AD 65–95), and the Gospel of John (AD 75–100). Furthermore, most scholars agree that the authors of Matthew and Luke used Mark as a source when writing their gospels. Matthew and Luke also share some content not found in Mark. To explain this, many scholars believe that in addition to Mark, another source (commonly called the "Q source") was used by the two authors. Matthew, Mark, and Luke are known as the Synoptic Gospels, from the Greek σύν (syn "together") and ὄψις (opsis "view"). They are similar in content, narrative arrangement, language and paragraph structure. Scholars generally agree that it is impossible to find any direct literary relationship between the Synoptic Gospels and the Gospel of John. While the flow of some events (such as Jesus' baptism, transfiguration, crucifixion and interactions with the apostles) are shared among the Synoptic Gospels, incidents such as the transfiguration do not appear in John, which also differs on other matters, such as the Cleansing of the Temple. The Synoptics emphasize different aspects of Jesus. In Mark, Jesus is the Son of God whose mighty works demonstrate the presence of God's Kingdom. He is a tireless wonder worker, the servant of both God and man. This short gospel records few of Jesus' words or teachings. The Gospel of Matthew emphasizes that Jesus is the fulfillment of God's will as revealed in the Old Testament, and he is the Lord of the Church. He is the "Son of David", a "king", and the Messiah. Luke presents Jesus as the divine-human savior who shows compassion to the needy. He is the friend of sinners and outcasts, come to seek and save the lost. This gospel includes Jesus' most beloved parables, such as the Good Samaritan and the Prodigal Son. The prologue to the Gospel of John identifies Jesus as an incarnation of the divine Word (Logos). As the Word, Jesus was eternally present with God, active in all creation, and the source of humanity's moral and spiritual nature. Jesus is not only greater than any past human prophet but greater than any prophet could be. He not only speaks God's Word; he is God's Word. In the Gospel of John, Jesus reveals his divine role publicly. Here he is the Bread of Life, the Light of the World, the True Vine and more. In general, the authors of the New Testament showed little interest in an absolute chronology of Jesus or in synchronizing the episodes of his life with the secular history of the age. As stated in John 21:25, the gospels do not claim to provide an exhaustive list of the events in the life of Jesus. The accounts were primarily written as theological documents in the context of early Christianity, with timelines as a secondary consideration. In this respect, it is noteworthy that the Gospels devote about one third of their text to the last week of the life of Jesus in Jerusalem, referred to as the Passion. Although the gospels do not provide enough details to satisfy the demands of modern historians regarding exact dates, it is possible to draw from them a general picture of the life story of Jesus. Matthew and Luke each describe Jesus' birth, especially that Jesus was born by a virgin named Mary in Bethlehem in fulfillment of prophecy. Luke's account emphasizes events before the birth of Jesus and centers on Mary, while Matthew's mostly covers those after the birth and centers on Joseph. Both accounts state that Jesus was born to Joseph and Mary, his betrothed, in Bethlehem, and both support the doctrine of the virgin birth of Jesus, according to which Jesus was miraculously conceived by the Holy Spirit in Mary's womb when she was still a virgin. At the same time, there is evidence, at least in the Lukan Acts of the Apostles, that Jesus was thought to have had, like many figures in antiquity, a dual paternity, since there it is stated he descended from the seed or loins of David. In Matthew, Joseph is troubled because Mary, his betrothed, is pregnant (Matthew 1:19–20), but in the first of Joseph's three dreams an angel assures him not to be afraid to take Mary as his wife, because her child was conceived by the Holy Spirit. In Matthew 2:1–12, wise men or Magi from the East bring gifts to the young Jesus as the King of the Jews. They find Jesus in a house in Bethlehem and not a barn and Jesus is now a child and not an infant. Matthew focuses on an event after the Luke Nativity where Jesus was an infant. In Matthew Herod the Great hears of Jesus' birth and, wanting him killed, orders the murders of male infants in Bethlehem under age of 2. But an angel warns Joseph in his second dream, and the family flees to Egypt—later to return and settle in Nazareth. In Luke 1:31–38, Mary learns from the angel Gabriel that she will conceive and bear a child called Jesus through the action of the Holy Spirit. When Mary is due to give birth, she and Joseph travel from Nazareth to Joseph's ancestral home in Bethlehem to register in the census ordered by Caesar Augustus. While there Mary gives birth to Jesus, and as they have found no room in the inn, she places the newborn in a manger (Luke 2:1–7). An angel announces the birth to some shepherds, who go to Bethlehem to see Jesus, and subsequently spread the news abroad (Luke 2:8–20). After the presentation of Jesus at the Temple, Joseph, Mary and Jesus return to Nazareth. Jesus' childhood home is identified in the gospels of Luke and Matthew as the town of Nazareth in Galilee, where he lived with his family. Although Joseph appears in descriptions of Jesus' childhood, no mention is made of him thereafter. His other family members—his mother, Mary, his brothers James, Joses (or Joseph), Judas and Simon and his unnamed sisters—are mentioned in the gospels and other sources. The Gospel of Mark reports that Jesus comes into conflict with his neighbors and family. Jesus' mother and brothers come to get him (Mark 3:31–35) because people are saying that he is crazy (Mark 3:21). Jesus responds that his followers are his true family. In John, Mary follows Jesus to his crucifixion, and he expresses concern over her well-being (John 19:25–27). Jesus is called a τέκτων (tektōn) in Mark 6:3, traditionally understood as carpenter but could cover makers of objects in various materials, including builders. The gospels indicate that Jesus could read, paraphrase, and debate scripture, but this does not necessarily mean that he received formal scribal training. When Jesus is presented as a baby in the temple per Jewish Law, a man named Simeon says to Mary and Joseph that Jesus "shall stand as a sign of contradiction, while a sword will pierce your own soul. Then the secret thoughts of many will come to light" (Luke 2:28–35). Several years later, when Jesus goes missing on a visit to Jerusalem, his parents find him in the temple sitting among the teachers, listening to them and asking questions, and the people are amazed at his understanding and answers; Mary scolds Jesus for going missing, to which Jesus replies that he must "be in his father's house" (Luke 2:41–52). The Synoptic accounts of Jesus' baptism are all preceded by information about John the Baptist. They show John preaching penance and repentance for the remission of sins and encouraging the giving of alms to the poor (Luke 3:11) as he baptizes people in the area of the Jordan River around Perea and foretells (Luke 3:16) the arrival of someone "more powerful" than he. Later, Jesus identifies John as "the Elijah who was to come" (Matthew 11:14, Mark 9:13–14), the prophet who was expected to arrive before the "great and terrible day of the Lord" (Malachi 4:5). Likewise, Luke says that John had the spirit and power of Elijah (Luke 1:17). In Mark, John baptizes Jesus, and as he comes out of the water he sees the Holy Spirit descending to him like a dove and he hears a voice from heaven declaring him to be God's Son (Mark 1:9–11). This is one of two events described in the gospels where a voice from Heaven calls Jesus "Son", the other being the Transfiguration. The spirit then drives him into the wilderness where he is tempted by Satan (Mark 1:12–13). Jesus then begins his ministry after John's arrest (Mark 1:14). Jesus' baptism in Matthew is similar. Here, before Jesus' baptism, John protests, saying, "I need to be baptized by you" (Matthew 3:14). Jesus instructs him to carry on with the baptism "to fulfill all righteousness" (Matthew 3:15). Matthew also details the three temptations that Satan offers Jesus in the wilderness (Matthew 4:3–11). In Luke, the Holy Spirit descends as a dove after everyone has been baptized and Jesus is praying (Luke 3:21–22). John implicitly recognizes Jesus from prison after sending his followers to ask about him (Luke 7:18–23). Jesus' baptism and temptation serve as preparation for his public ministry. The Gospel of John leaves out Jesus' baptism and temptation. Here, John the Baptist testifies that he saw the Spirit descend on Jesus (John 1:32). John publicly proclaims Jesus as the sacrificial Lamb of God, and some of John's followers become disciples of Jesus. In this Gospel, John denies that he is Elijah (John 1:21). Before John is imprisoned, Jesus leads his followers to baptize disciples as well (John 3:22–24), and they baptize more people than John (John 4:1). The Synoptics depict two distinct geographical settings in Jesus' ministry. The first takes place north of Judea, in Galilee, where Jesus conducts a successful ministry; and the second shows Jesus rejected and killed when he travels to Jerusalem. Often referred to as "rabbi", Jesus preaches his message orally. Notably, Jesus forbids those who recognize him as the Messiah to speak of it, including people he heals and demons he exorcises (see Messianic Secret). Scholars divide the ministry of Jesus into several stages. The Galilean ministry begins when Jesus returns to Galilee from the Judaean Desert after rebuffing the temptation of Satan. Jesus preaches around Galilee, and in Matthew 4:18–20, his first disciples, who will eventually form the core of the early Church, encounter him and begin to travel with him. This period includes the Sermon on the Mount, one of Jesus' major discourses, as well as the calming of the storm, the feeding of the 5,000, walking on water and a number of other miracles and parables. It ends with the Confession of Peter and the Transfiguration. As Jesus travels towards Jerusalem, in the Perean ministry, he returns to the area where he was baptized, about a third of the way down from the Sea of Galilee along the Jordan River (John 10:40–42). The final ministry in Jerusalem begins with Jesus' triumphal entry into the city on Palm Sunday. In the Synoptic Gospels, during that week Jesus drives the money changers from the Second Temple and Judas bargains to betray him. This period culminates in the Last Supper and the Farewell Discourse. Near the beginning of his ministry, Jesus appoints twelve apostles. In Matthew and Mark, despite Jesus only briefly requesting that they join him, Jesus' first four apostles, who were fishermen, are described as immediately consenting, and abandoning their nets and boats to do so (Matthew 4:18–22, Mark 1:16–20). In John, Jesus' first two apostles were disciples of John the Baptist. The Baptist sees Jesus and calls him the Lamb of God; the two hear this and follow Jesus. In addition to the Twelve Apostles, the opening of the passage of the Sermon on the Plain identifies a much larger group of people as disciples (Luke 6:17). Also, in Luke 10:1–16 Jesus sends seventy or seventy-two of his followers in pairs to prepare towns for his prospective visit. They are instructed to accept hospitality, heal the sick and spread the word that the Kingdom of God is coming. In Mark, the disciples are notably obtuse. They fail to understand Jesus' miracles (Mark 4:35–41, Mark 6:52), his parables (Mark 4:13), or what "rising from the dead" would mean (Mark 9:9–10). When Jesus is later arrested, they desert him. In the Synoptics, Jesus teaches extensively, often in parables, about the Kingdom of God (or, in Matthew, the Kingdom of Heaven). The Kingdom is described as both imminent (Mark 1:15) and already present in the ministry of Jesus (Luke 17:21). Jesus promises inclusion in the Kingdom for those who accept his message (Mark 10:13–27). Jesus talks of the "Son of Man," an apocalyptic figure who would come to gather the chosen. Jesus calls people to repent their sins and to devote themselves completely to God. Jesus tells his followers to adhere to Jewish law, although he is perceived by some to have broken the law himself, for example regarding the Sabbath. When asked what the greatest commandment is, Jesus replies: "You shall love the Lord your God with all your heart, and with all your soul, and with all your mind ... And a second is like it: 'You shall love your neighbor as yourself" (Matthew 22:37–39). Other ethical teachings of Jesus include loving your enemies, refraining from hatred and lust, turning the other cheek, and forgiving people who have sinned against you (Matthew 5–7). John's Gospel presents the teachings of Jesus not merely as his own preaching, but as divine revelation. John the Baptist, for example, states in John 3:34: "He whom God has sent speaks the words of God, for he gives the Spirit without measure." In John 7:16 Jesus says, "My teaching is not mine but his who sent me." He asserts the same thing in John 14:10: "Do you not believe that I am in the Father and the Father is in me? The words that I say to you I do not speak on my own; but the Father who dwells in me does his works." Approximately thirty parables form about one third of Jesus' recorded teachings. The parables appear within longer sermons and at other places in the narrative. They often contain symbolism, and usually relate the physical world to the spiritual. Common themes in these tales include the kindness and generosity of God and the perils of transgression. Some of his parables, such as the Prodigal Son (Luke 15:11–32), are relatively simple, while others, such as the Growing Seed (Mark 4:26–29), are sophisticated, profound and abstruse. When asked by his disciples about why he speaks in parables to the people, Jesus replies that the chosen disciples have been given to "know the secrets of the kingdom of heaven", unlike the rest of their people, "For the one who has will be given more and he will have in abundance. But the one who does not have will be deprived even more. ", going on to say that the majority of their generation have grown "dull hearts" and thus are unable to understand (Matthew 13:10–17). In the gospel accounts, Jesus devotes a large portion of his ministry performing miracles, especially healings. The miracles can be classified into two main categories: healing miracles and nature miracles. The healing miracles include cures for physical ailments, exorcisms, and resurrections of the dead. The nature miracles show Jesus' power over nature, and include turning water into wine, walking on water, and calming a storm, among others. Jesus states that his miracles are from a divine source. When Jesus' opponents suddenly accuse him of performing exorcisms by the power of Beelzebul, the prince of demons, Jesus counters that he performs them by the "Spirit of God" (Matthew 12:28) or "finger of God", arguing that all logic suggests that Satan would not let his demons assist the Children of God because it would divide Satan's house and bring his kingdom to desolation; furthermore, he asks his opponents that if he exorcises by Beel'zebub, "by whom do your sons cast them out? "(Luke 11:20). In Matthew 12:31–32, he goes on to say that while all manner of sin, "even insults against God" or "insults against the son of man", shall be forgiven, whoever insults goodness (or "The Holy Spirit") shall never be forgiven; he/she carries the guilt of his/her sin forever. In John, Jesus' miracles are described as "signs", performed to prove his mission and divinity. However, in the Synoptics, when asked by some teachers of the Law and some Pharisees to give miraculous signs to prove his authority, Jesus refuses, saying that no sign shall come to corrupt and evil people except the sign of the prophet Jonah. Also, in the Synoptic Gospels, the crowds regularly respond to Jesus' miracles with awe and press on him to heal their sick. In John's Gospel, Jesus is presented as unpressured by the crowds, who often respond to his miracles with trust and faith. One characteristic shared among all miracles of Jesus in the gospel accounts is that he performed them freely and never requested or accepted any form of payment. The gospel episodes that include descriptions of the miracles of Jesus also often include teachings, and the miracles themselves involve an element of teaching. Many of the miracles teach the importance of faith. In the cleansing of ten lepers and the raising of Jairus' daughter, for instance, the beneficiaries are told that their healing was due to their faith. In the Transfiguration (Matthew 17:1–9, Mark 9:2–8, and Luke 9:28–36), Jesus takes Peter and two other apostles up an unnamed mountain, where "he was transfigured before them, and his face shone like the sun, and his clothes became dazzling white." A bright cloud appears around them, and a voice from the cloud says, "This is my Son, the Beloved; with him I am well pleased; listen to him" (Matthew 17:1–9). Jesus identifies himself as a Jew to the Samaritan woman at the well, as evidenced by the plural we and the saying "salvation is from the Jews"—a saying that is in accordance with the Jewish concept of salvation, and is a possible reference to Isaiah 49:6. When the woman says she is awaiting the messiah Jesus replies that he is the one she is awaiting. During the Feast of Dedication Jesus says "I and the Father are one," which prompts the Jewish leaders to attempt to stone him for blasphemy (claiming to be God). Seven "I am" sayings are attributed to Jesus: he is the bread of life that makes one no longer hunger or thirst; the light of the world that makes one no longer walk in darkness but have the light of life; the gate through which one is saved; the good shepherd that lays down his life for his sheep; the resurrection and the life that gives one eternal life; the way, the truth, and the life throug which one goes to God the Father; and the true vine of God's vineyard. In the Synoptics Jesus and his disciples do not wash their hands before eating a meal, contrary to handwashing in Judaism. Jesus' disciples also do not practice ta'anit, contrary to John the Baptist's disciples. Jesus' disciples even pick and eat grain on the Sabbath, contrary to the Pharisees. None of this behavior is found in the Gospel of John. The description of the last week of the life of Jesus (often called Passion Week) occupies about one third of the narrative in the canonical gospels, starting with Jesus' triumphal entry into Jerusalem and ending with his Crucifixion. In the Synoptics, the last week in Jerusalem is the conclusion of the journey through Perea and Judea that Jesus began in Galilee. Jesus rides a young donkey into Jerusalem, reflecting the tale of the Messiah's Donkey, an oracle from the Book of Zechariah in which the Jews' humble king enters Jerusalem this way (Zechariah 9:9). People along the way lay cloaks and small branches of trees (known as palm fronds) in front of him and sing part of Psalms 118:25–26. Jesus next expels the money changers from the Second Temple, accusing them of turning it into a den of thieves through their commercial activities. Jesus then prophesies about the coming destruction, including false prophets, wars, earthquakes, celestial disorders, persecution of the faithful, the appearance of an "abomination of desolation," and unendurable tribulations (Mark 13:1–23). The mysterious "Son of Man," he says, will dispatch angels to gather the faithful from all parts of the earth (Mark 13:24–27). Jesus warns that these wonders will occur in the lifetimes of the hearers (Mark 13:28–32). In John, the Cleansing of the Temple occurs at the beginning of Jesus' ministry instead of at the end (John 2:13–16). Jesus comes into conflict with the Jewish elders, such as when they question his authority and when he criticizes them and calls them hypocrites. Judas Iscariot, one of the twelve apostles, secretly strikes a bargain with the Jewish elders, agreeing to betray Jesus to them for 30 silver coins. The Gospel of John recounts of two other feasts in which Jesus taught in Jerusalem before the Passion Week (John 7:1–10:42). In Bethany, a village near Jerusalem, Jesus raises Lazarus from the dead. This potent sign increases the tension with authorities, who conspire to kill him (John 11). Mary of Bethany anoints Jesus' feet, foreshadowing his entombment. Jesus then makes his Messianic entry into Jerusalem. The cheering crowds greeting Jesus as he enters Jerusalem add to the animosity between him and the establishment. In John, Jesus has already cleansed the Second Temple during an earlier Passover visit to Jerusalem. John next recounts Jesus' Last Supper with his disciples. The Last Supper is the final meal that Jesus shares with his 12 apostles in Jerusalem before his crucifixion. The Last Supper is mentioned in all four canonical gospels; Paul's First Epistle to the Corinthians (11:23–26) also refers to it. During the meal, Jesus predicts that one of his apostles will betray him. Despite each Apostle's assertion that he would not betray him, Jesus reiterates that the betrayer would be one of those present. Matthew 26:23–25 and John 13:26–27 specifically identify Judas as the traitor. In the Synoptics, Jesus takes bread, breaks it, and gives it to the disciples, saying, "This is my body, which is given for you". He then has them all drink from a cup, saying, "This cup that is poured out for you is the new covenant in my blood" (Luke 22:19–20). The Christian sacrament or ordinance of the Eucharist is based on these events. Although the Gospel of John does not include a description of the bread-and-wine ritual during the Last Supper, most scholars agree that John 6:22–59 (the Bread of Life Discourse) has a eucharistic character and resonates with the institution narratives in the Synoptic Gospels and in the Pauline writings on the Last Supper. In all four gospels, Jesus predicts that Peter will deny knowledge of him three times before the rooster crows the next morning. In Luke and John, the prediction is made during the Supper (Luke 22:34, John 22:34). In Matthew and Mark, the prediction is made after the Supper; Jesus also predicts that all his disciples will desert him (Matthew 26:31–34, Mark 14:27–30). The Gospel of John provides the only account of Jesus washing his disciples' feet after the meal. John also includes a long sermon by Jesus, preparing his disciples (now without Judas) for his departure. Chapters 14–17 of the Gospel of John are known as the Farewell Discourse and are a significant source of Christological content. In the Synoptics, Jesus and his disciples go to the garden Gethsemane, where Jesus prays to be spared his coming ordeal. Then Judas comes with an armed mob, sent by the chief priests, scribes and elders. He kisses Jesus to identify him to the crowd, which then arrests Jesus. In an attempt to stop them, an unnamed disciple of Jesus uses a sword to cut off the ear of a man in the crowd. After Jesus' arrest, his disciples go into hiding, and Peter, when questioned, thrice denies knowing Jesus. After the third denial, Peter hears the rooster crow and recalls Jesus' prediction about his denial. Peter then weeps bitterly. In John (18:1–11), Jesus does not pray to be spared his crucifixion, as the gospel portrays him as scarcely touched by such human weakness. The people who arrest him are Roman soldiers and Temple guards. Instead of being betrayed by a kiss, Jesus proclaims his identity, and when he does, the soldiers and officers fall to the ground. The gospel identifies Peter as the disciple who used the sword, and Jesus rebukes him for it. After his arrest, Jesus is taken to the Sanhedrin, a Jewish judicial body. The gospel accounts differ on the details of the trials. In Matthew 26:57, Mark 14:53 and Luke 22:54, Jesus is taken to the house of the high priest, Caiaphas, where he is mocked and beaten that night. Early the next morning, the chief priests and scribes lead Jesus away into their council. John 18:12–14 states that Jesus is first taken to Annas, Caiaphas' father-in-law, and then to the high priest. During the trials Jesus speaks very little, mounts no defense, and gives very infrequent and indirect answers to the priests' questions, prompting an officer to slap him. In Matthew 26:62 Jesus' unresponsiveness leads Caiaphas to ask him, "Have you no answer?" In Mark 14:61 the high priest then asks Jesus, "Are you the Messiah, the Son of the Blessed One?" Jesus replies, "I am", and then predicts the coming of the Son of Man. This provokes Caiaphas to tear his own robe in anger and to accuse Jesus of blasphemy. In Matthew and Luke, Jesus' answer is more ambiguous: in Matthew 26:64 he responds, "You have said so", and in Luke 22:70 he says, "You say that I am". The Jewish elders take Jesus to Pilate's Court and ask the Roman governor, Pontius Pilate, to judge and condemn Jesus for various allegations, accusing him of blasphemy, perverting the nation, forbidding the payment of tribute, inciting sedition against Rome, sorcery, claiming to be the King of the Jews, the Son of God, and a savior to the world. The use of the word "king" is central to the discussion between Jesus and Pilate. In John 18:36 Jesus states, "My kingdom is not from this world", but he does not unequivocally deny being the King of the Jews. In Luke 23:7–15 Pilate realizes that Jesus is a Galilean, and thus comes under the jurisdiction of Herod Antipas, the Tetrarch of Galilee and Perea. Pilate sends Jesus to Herod to be tried, but Jesus says almost nothing in response to Herod's questions. Herod and his soldiers mock Jesus, put an expensive robe on him to make him look like a king, and return him to Pilate, who then calls together the Jewish elders and announces that he has "not found this man guilty". Observing a Passover custom of the time, Pilate allows one prisoner chosen by the crowd to be released. He gives the people a choice between Jesus and a murderer called Barabbas (בר-אבא or Bar-abbâ, "son of the father", from the common given name Abba: 'father'). Persuaded by the elders (Matthew 27:20), the mob chooses to release Barabbas and crucify Jesus. Pilate writes a sign in Hebrew, Latin, and Greek that reads "Jesus of Nazareth, the King of the Jews" (abbreviated as INRI in depictions) to be affixed to Jesus' cross (John 19:19–20), then scourges Jesus and sends him to be crucified. The soldiers place a Crown of Thorns on Jesus' head and ridicule him as the King of the Jews. They beat and taunt him before taking him to Calvary, also called Golgotha, for crucifixion. Jesus' crucifixion is described in all four canonical gospels. After the trials, Jesus is led to Calvary carrying his cross; the route traditionally thought to have been taken is known as the Via Dolorosa. The three Synoptic Gospels indicate that Simon of Cyrene assists him, having been compelled by the Romans to do so. In Luke 23:27–28 Jesus tells the women in the multitude of people following him not to weep for him but for themselves and their children. At Calvary, Jesus is offered a sponge soaked in a concoction usually offered as a painkiller. According to Matthew and Mark, he refuses it. The soldiers then crucify Jesus and cast lots for his clothes. Above Jesus' head on the cross is Pilate's inscription, "Jesus of Nazareth, the King of the Jews." Soldiers and passersby mock him about it. Two convicted thieves are crucified along with Jesus. In Matthew and Mark, both thieves mock Jesus. In Luke, one of them rebukes Jesus, while the other defends him. Jesus tells the latter: "today you will be with me in Paradise" (Luke 23:43). In John, Mary, the mother of Jesus, and the beloved disciple were at the crucifixion. Jesus tells the beloved disciple to take care of his mother (John 19:26–27). The Roman soldiers break the two thieves' legs (a procedure designed to hasten death in a crucifixion), but they do not break those of Jesus, as he is already dead (John 19:33). In John 19:34, one soldier pierces Jesus' side with a lance, and blood and water flow out. In the Synoptics, when Jesus dies, the heavy curtain at the Temple is torn. In Matthew 27:51–54, an earthquake breaks open tombs. In Matthew and Mark, terrified by the events, a Roman centurion states that Jesus was the Son of God. On the same day, Joseph of Arimathea, with Pilate's permission and with Nicodemus' help, removes Jesus' body from the cross, wraps him in a clean cloth, and buries him in his new rock-hewn tomb. In Matthew 27:62–66, on the following day the chief Jewish priests ask Pilate for the tomb to be secured, and with Pilate's permission the priests place seals on the large stone covering the entrance. Mary Magdalene (alone in the Gospel of John, but accompanied by other women in the Synoptics) goes to Jesus' tomb on Sunday morning and is surprised to find it empty. Despite Jesus' teaching, the disciples had not understood that Jesus would rise again. In Matthew, there are guards at the tomb. An angel descends from heaven, and opens the tomb. The guards faint from fear. Jesus appears to Mary Magdalene and "the other Mary" after they visited the tomb. Jesus then appears to the eleven remaining disciples in Galilee and commissions them to baptize all nations in the name of the Father, Son and Holy Spirit. In Mark, Salome and Mary, mother of James are with Mary Magdalene (Mark 16:1). In the tomb, a young man in a white robe (an angel) tells them that Jesus will meet his disciples in Galilee, as he had told them (referring to Mark 14:28). In Luke, Mary and various other women meet two angels at the tomb, but the eleven disciples do not believe their story (Luke 25:1–12). Jesus appears to two of his followers in Emmaus. He also makes an appearance to Peter. Jesus then appears that same day to his disciples in Jerusalem (Luke 24:13–43). Although he appears and vanishes mysteriously, he also eats and lets them touch him to prove that he is not a spirit. He repeats his command to bring his teaching to all nations (Luke 24:51). In John, Mary is alone at first, but Peter and the beloved disciple come and see the tomb as well. Jesus then appears to Mary at the tomb. He later appears to the disciples, breathes on them, and gives them the power to forgive and retain sins. In a second visit to disciples, he proves to a doubting disciple ("Doubting Thomas") that he is flesh and blood. The disciples return to Galilee, where Jesus makes another appearance. He performs a miracle known as the catch of 153 fish at the Sea of Galilee, after which Jesus encourages Peter to serve his followers. Jesus' ascension into Heaven is described in Luke 24:50–53, Acts 1:1–11 and mentioned in 1 Timothy 3:16. In the Acts of the Apostles, forty days after the Resurrection, as the disciples look on, "he was lifted up, and a cloud took him out of their sight". 1 Peter 3:22 states that Jesus has "gone into heaven and is at the right hand of God". The Acts of the Apostles describes several appearances of Jesus after his Ascension. In Acts 7:55, Stephen gazes into heaven and sees "Jesus standing at the right hand of God" just before his death. On the road to Damascus, the Apostle Paul is converted to Christianity after seeing a blinding light and hearing a voice saying, "I am Jesus, whom you are persecuting" (Acts 9:5). In Acts 9:10–18, Jesus instructs Ananias of Damascus in a vision to heal Paul. The Book of Revelation includes a revelation from Jesus concerning the last days. After Jesus's life, his followers, as described in the first chapters of the Acts of the Apostles, were all Jews either by birth or conversion, for which the biblical term "proselyte" is used, and referred to by historians as Jewish Christians. The early Gospel message was spread orally, probably in Aramaic, but almost immediately also in Greek. The New Testament's Acts of the Apostles and Epistle to the Galatians record that the first Christian community was centered in Jerusalem and its leaders included Peter, James, the brother of Jesus, and John the Apostle. After the conversion of Paul the Apostle, he claimed the title of "Apostle to the Gentiles". Paul's influence on Christian thinking is said to be more significant than that of any other New Testament author. By the end of the 1st century, Christianity began to be recognized internally and externally as a separate religion from Judaism which itself was refined and developed further in the centuries after the destruction of the Second Temple. Numerous quotations in the New Testament and other Christian writings of the first centuries, indicate that early Christians generally used and revered the Hebrew Bible (the Tanakh) as religious text, mostly in the Greek (Septuagint) or Aramaic (Targum) translations. Early Christians wrote many religious works, including the ones included in the canon of the New Testament. The canonical texts, which have become the main sources used by historians to try to understand the historical Jesus and sacred texts within Christianity, were probably written between 50 and 120 AD. In AD 6, Judea, Idumea, and Samaria were transformed from a client kingdom of the Roman Empire into an imperial province, also called Judea. A Roman prefect, rather than a client king, ruled the land. The prefect ruled from Caesarea Maritima, leaving Jerusalem to be run by the High Priest of Israel. As an exception, the prefect came to Jerusalem during religious festivals, when religious and patriotic enthusiasm sometimes inspired unrest or uprisings. Gentile lands surrounded the Jewish territories of Judea and Galilee, but Roman law and practice allowed Jews to remain separate legally and culturally. Galilee was evidently prosperous, and poverty was limited enough that it did not threaten the social order. This was the era of Hellenistic Judaism, which combined Jewish religious tradition with elements of Hellenistic Greek culture. Until the fall of the Roman Empire and the Muslim conquests of the Eastern Mediterranean, the main centers of Hellenistic Judaism were Alexandria (Egypt) and Antioch (now Southern Turkey), the two main Greek urban settlements of the Middle East and North Africa area, both founded at the end of the 4th century BCE in the wake of the conquests of Alexander the Great. Hellenistic Judaism also existed in Jerusalem during the Second Temple Period, where there was conflict between Hellenizers and traditionalists (sometimes called Judaizers). The Hebrew Bible was translated from Biblical Hebrew and Biblical Aramaic into Jewish Koiné Greek; the Targum translations into Aramaic were also generated during this era, both due to the decline of knowledge of Hebrew. New Testament scholars face a formidable challenge when they analyze the canonical Gospels. The Gospels are not biographies in the modern sense, and the authors explain Jesus' theological significance and recount his public ministry while omitting many details of his life. The reports of supernatural events associated with Jesus' death and resurrection make the challenge even more difficult. Scholars regard the gospels as compromised sources of information because the writers were trying to glorify Jesus. Even so, the sources for Jesus' life are better than sources scholars have for the life of Alexander the Great. Scholars use a number of criteria, such as the criterion of independent attestation, the criterion of coherence, and the criterion of discontinuity to judge the historicity of events. The historicity of an event also depends on the reliability of the source; indeed, the gospels are not independent nor consistent records of Jesus' life. Mark, which is most likely the earliest written gospel, has been considered for many decades the most historically accurate. 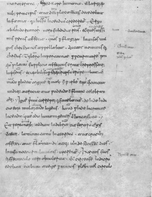 John, the latest written gospel, differs considerably from the Synoptic Gospels, and thus is generally considered less reliable, although more and more scholars now also recognize that it may contain a core of older material as historically valuable as the Synoptic tradition or even more so. The non-canonical Gospel of Thomas might be an independent witness to many of Jesus' parables and aphorisms. For example, Thomas confirms that Jesus blessed the poor and that this saying circulated independently before being combined with similar sayings in the Q source. Other select non-canonical Christian texts may also have value for historical Jesus research. Early non-Christian sources that attest to the historical existence of Jesus include the works of the historians Josephus and Tacitus. [p] Josephus scholar Louis Feldman has stated that "few have doubted the genuineness" of Josephus' reference to Jesus in book 20 of the Antiquities of the Jews, and it is disputed only by a small number of scholars. Tacitus referred to Christ and his execution by Pilate in book 15 of his work Annals. Scholars generally consider Tacitus's reference to the execution of Jesus to be both authentic and of historical value as an independent Roman source. Jesus was a Galilean Jew, born around the beginning of the 1st century, who died in 30 or 33 AD in Judea. The general scholarly consensus is that Jesus was a contemporary of John the Baptist and was crucified by the Roman governor Pontius Pilate, who held office from 26 to 36 AD. The years of Jesus' ministry have been estimated using several different approaches. One of these applies the reference in Luke 3:1–2, Acts 10:37–38 and the dates of Tiberius' reign, which are well known, to give a date of around 28–29 AD for the start of Jesus' ministry. Another approach uses the statement about the temple in John 2:13–20, which asserts that the temple in Jerusalem was in its 46th year of construction at the start of Jesus' ministry, together with Josephus' statement that the temple's reconstruction was started by Herod the Great in the 18th year of his reign, to estimate a date around 27–29 AD. A further method uses the date of the death of John the Baptist and the marriage of Herod Antipas to Herodias, based on the writings of Josephus, and correlates it with Matthew 14:4 and Mark 6:18. Given that most scholars date the marriage of Herod and Herodias as AD 28–35, this yields a date about 28–29 AD. A number of approaches have been used to estimate the year of the crucifixion of Jesus. Most scholars agree that he died in 30 or 33 AD. The gospels state that the event occurred during the prefecture of Pilate, the Roman governor of Judea from 26 to 36 AD. The date for the conversion of Paul (estimated to be 33–36 AD) acts as an upper bound for the date of Crucifixion. The dates for Paul's conversion and ministry can be determined by analyzing the Pauline epistles and the Acts of the Apostles. Astronomers have tried to estimate the precise date of the Crucifixion by analyzing lunar motion and calculating historic dates of Passover, a festival based on the lunisolar Hebrew calendar. The most widely accepted dates derived from this method are April 7, 30 AD, and April 3, 33 AD (both Julian). Roman senator and historian Tacitus mentioned the execution of "Christus" (Jesus) by Pilate in a passage describing the Great Fire of Rome and Nero's persecution of Christians in the Annals, a history of the Roman Empire during the 1st century. According to Theissen and Merz, it is common for extraordinary charismatic leaders, such as Jesus, to come into conflict with their ordinary families. In Mark, Jesus' family comes to get him, fearing that he is mad (Mark 3:20–34), and this account is likely historical because early Christians would not have invented it. After Jesus' death, many members of his family joined the Christian movement. Jesus' brother James became a leader of the Jerusalem Church. Géza Vermes says that the doctrine of the virgin birth of Jesus arose from theological development rather than from historical events. Despite the widely held view that the authors of the Synoptic Gospels drew upon each other (the so-called synoptic problem), other scholars take it as significant that the virgin birth is attested by two separate gospels, Matthew and Luke. According to E. P. Sanders, the birth narratives in Matthew and Luke are the clearest case of invention in the Gospel narratives of Jesus' life. Both accounts have Jesus born in Bethlehem, in accordance with Jewish salvation history, and both have him growing up in Nazareth. But Sanders points that the two Gospels report completely different and irreconcilable explanations for how that happened. Luke's account of a census in which everyone returned to their ancestral cities is not plausible. Matthew's account is more plausible, but the story reads as though it was invented to identify Jesus as like a new Moses, and the historian Josephus reports Herod the Great's brutality without ever mentioning that he massacred little boys. Sanders says that the genealogies of Jesus are based not on historical information but on the authors' desire to show that Jesus was the universal Jewish savior. In any event, once the doctrine of the virgin birth of Jesus became established, that tradition superseded the earlier tradition that he was descended from David through Joseph. Luke reports that Jesus was a blood relation of John the Baptist, but scholars generally consider this connection to be invented. Most modern scholars consider Jesus' baptism to be a definite historical fact, along with his crucifixion. Theologian James D. G. Dunn states that they "command almost universal assent" and "rank so high on the 'almost impossible to doubt or deny' scale of historical facts" that they are often the starting points for the study of the historical Jesus. Scholars adduce the criterion of embarrassment, saying that early Christians would not have invented a baptism that might imply that Jesus committed sins and wanted to repent. According to Theissen and Merz, Jesus was inspired by John the Baptist and took over from him many elements of his teaching. According to Ehrman, Jesus taught that a coming kingdom was everyone's proper focus, not anything in this life. He taught about the Jewish Law, seeking its true meaning, sometimes in opposition to other traditions. Jesus put love at the center of the Law, and following that Law was an apocalyptic necessity. His ethical teachings called for forgiveness, not judging others, loving enemies, and caring for the poor. Funk and Hoover note that typical of Jesus were paradoxical or surprising turns of phrase, such as advising one, when struck on the cheek, to offer the other cheek to be struck as well (Luke 6:29). The Gospels portray Jesus teaching in well-defined sessions, such as the Sermon on the Mount in the Gospel of Matthew or the parallel Sermon on the Plain in Luke. According to Gerd Theissen and Annette Merz, these teaching sessions include authentic teachings of Jesus, but the scenes were invented by the respective evangelists to frame these teachings, which had originally been recorded without context. While Jesus' miracles fit within the social context of antiquity, he defined them differently. First, he attributed them to the faith of those healed. Second, he connected them to end times prophecy. Jesus chose twelve disciples  (the "Twelve"), evidently as an apocalyptic message. All three Synoptics mention the Twelve, although the names on Luke's list vary from those in Mark and Matthew, suggesting that Christians were not certain who all the disciples were. The 12 disciples might have represented the twelve original tribes of Israel, which would be restored once God's rule was instituted. The disciples were reportedly meant to be the rulers of the tribes in the coming Kingdom (Matthew 19:28, Luke 22:30). According to Bart Ehrman, Jesus' promise that the Twelve would rule is historical, because the Twelve included Judas Iscariot. In Ehrman's view, no Christians would have invented a line from Jesus, promising rulership to the disciple who betrayed him. In Mark, the disciples play hardly any role other than a negative one. While others sometimes respond to Jesus with complete faith, his disciples are puzzled and doubtful. They serve as a foil to Jesus and to other characters. The failings of the disciples are probably exaggerated in Mark, and the disciples make a better showing in Matthew and Luke. Sanders says that Jesus' mission was not about repentance, although he acknowledges that this opinion is unpopular. He argues that repentance appears as a strong theme only in Luke, that repentance was John the Baptist's message, and that Jesus' ministry would not have been scandalous if the sinners he ate with had been repentant. According to Theissen and Merz, Jesus taught that God was generously giving people an opportunity to repent. Jesus taught that an apocalyptic figure, the "Son of Man", would soon come on clouds of glory to gather the elect, or chosen ones (Mark 13:24–27, Matthew 24:29–31, Luke 21:25–28). He referred to himself as a "son of man" in the colloquial sense of "a person", but scholars do not know whether he also meant himself when he referred to the heavenly "Son of Man". Paul the Apostle and other early Christians interpreted the "Son of Man" as the risen Jesus. The title Christ, or Messiah, indicates that Jesus' followers believed him to be the anointed heir of King David, whom some Jews expected to save Israel. The Gospels refer to him not only as a Messiah but in the absolute form as "the Messiah" or, equivalently, "the Christ". In early Judaism, this absolute form of the title is not found, but only phrases such as "his Messiah". The tradition is ambiguous enough to leave room for debate as to whether Jesus defined his eschatological role as that of the Messiah. The Jewish messianic tradition included many different forms, some of them focused on a Messiah figure and others not. Based on the Christian tradition, Gerd Theissen advances the hypothesis that Jesus saw himself in messianic terms but did not claim the title "Messiah". Bart Ehrman argues that Jesus did consider himself to be the Messiah, albeit in the sense that he would be the king of the new political order that God would usher in, not in the sense that most people today think of the term. Around AD 30, Jesus and his followers traveled from Galilee to Jerusalem to observe Passover. Jesus caused a disturbance in the Second Temple, which was the center of Jewish religious and civil authority. Sanders associates it with Jesus' prophecy that the Temple would be totally demolished. Jesus had a last meal with his disciples, which is the origin of the Christian sacrament of bread and wine. Jesus' words are recorded in the Synoptics and in Paul's First Epistle to the Corinthians. The differences in the accounts cannot be completely reconciled, and it is impossible to know what Jesus intended, but in general the meal seems to point forward to the coming Kingdom. Jesus probably expected to be killed, and he may have hoped that God would intervene. The Gospels say that Jesus was betrayed to the authorities by a disciple, and many scholars consider this report to be highly reliable. He was executed on the orders of Pontius Pilate, the Roman prefect of Judaea. Pilate most likely saw Jesus' reference to the Kingdom of God as a threat to Roman authority and worked with the Temple elites to have Jesus executed. The Sadducean high-priestly leaders of the Temple more plausibly had Jesus executed for political reasons than for his teaching. They may have regarded him as a threat to stability, especially after he caused a disturbance at the Second Temple. Other factors, such as Jesus' triumphal entry into Jerusalem, may have contributed to this decision. Most scholars consider Jesus' crucifixion to be factual, because early Christians would not have invented the painful death of their leader. After Jesus' death, his followers said he rose from the dead, although exact details of their experiences are unclear. According to Sanders, the Gospel reports contradict each other, which, according to him, suggests competition among those claiming to have seen him first rather than deliberate fraud. On the other hand, L. Michael White suggests that inconsistencies in the Gospels reflect differences in the agendas of their unknown authors. The followers of Jesus formed a community to wait for his return and the founding of his kingdom. Jesus is seen as the founder of, in the words of Sanders, a '"renewal movement within Judaism." One of the criteria used to discern historical details in the "third quest" is the criterion of plausibility, relative to Jesus' Jewish context and to his influence on Christianity. A disagreement in contemporary research is whether Jesus was apocalyptic. Most scholars conclude that he was an apocalyptic preacher, like John the Baptist and Paul the Apostle. In contrast, certain prominent North American scholars, such as Burton Mack and John Dominic Crossan, advocate for a non-eschatological Jesus, one who is more of a Cynic sage than an apocalyptic preacher. In addition to portraying Jesus as an apocalyptic prophet, a charismatic healer or a cynic philosopher, some scholars portray him as the true Messiah or an egalitarian prophet of social change. However, the attributes described in the portraits sometimes overlap, and scholars who differ on some attributes sometimes agree on others. As the biological son of David, Jesus would be of the Jewish race, ethnicity, nation, and culture. One argument against this would be a contradiction in Jesus' genealogies: Matthew saying he is the son of Solomon and Luke saying he is the son of Nathan—Solomon and Nathan being brothers. John of Damascus taught that there is no contradiction, for Nathan wed Solomon's wife after Solomon died in accordance with scripture, namely, yibbum (the mitzvah that a man must marry his brother's childless widow). Jesus grew up in Galilee and much of his ministry took place there. The languages spoken in Galilee and Judea during the 1st century AD include Jewish Palestinian Aramaic, Hebrew, and Greek, with Aramaic being predominant. There is substantial consensus that Jesus gave most of his teachings in Aramaic. Modern scholars agree that Jesus was a Jew of 1st-century Palestine. Ioudaios in New Testament Greek[r] is a term which in the contemporary context may refer to religion (Second Temple Judaism), ethnicity (of Judea), or both. In a review of the state of modern scholarship, Amy-Jill Levine writes that the entire question of ethnicity is "fraught with difficulty", and that "beyond recognizing that 'Jesus was Jewish', rarely does the scholarship address what being 'Jewish' means". The New Testament describes Jesus wearing tzitzit—the tassels on a tallit—in Matthew 14:36 and Luke 8:43–44. Besides this, the New Testament gives no description of the physical appearance of Jesus before his death—it is generally indifferent to racial appearances and does not refer to the features of the people it mentions. Jesus probably looked like a typical Jew of his time and according to some scholars was likely to have had a sinewy appearance due to his ascetic and itinerant lifestyle. The Christ myth theory is the hypothesis that Jesus of Nazareth never existed; or if he did, that he had virtually nothing to do with the founding of Christianity and the accounts in the gospels. [s] Stories of Jesus' birth, along with other key events, have so many mythic elements that some scholars have suggested that Jesus himself was a myth. Bruno Bauer (1809–1882) taught that the first Gospel was a work of literature that produced history rather than described it. According to Albert Kalthoff (1850–1906) a social movement produced Jesus when it encountered Jewish messianic expectations. Arthur Drews (1865–1935) saw Jesus as the concrete form of a myth that predated Christianity. Despite arguments put forward by authors who have questioned the existence of a historical Jesus, there remains a strong consensus in historical-critical biblical scholarship that a historical Jesus did live in that area and in that time period. Apart from his own disciples and followers, the Jews of Jesus' day generally rejected him as the Messiah, as do the great majority of Jews today. Christian theologians, ecumenical councils, reformers and others have written extensively about Jesus over the centuries. Christian sects and schisms have often been defined or characterized by their descriptions of Jesus. Meanwhile, Manichaeans, Gnostics, Muslims, Baha'is, and others have found prominent places for Jesus in their religions. Jesus has also had detractors, both past and present. The Trinity is the belief in Christianity that God is one God in three persons: God the Father, God the Son (Jesus), and God the Holy Spirit. Jesus is depicted with the Alpha and Omega letters in the catacombs of Rome from the 4th century. Jesus is the central figure of Christianity. Although Christian views of Jesus vary, it is possible to summarize the key beliefs shared among major denominations, as stated in their catechetical or confessional texts. Christian views of Jesus are derived from various sources, including the canonical gospels and New Testament letters such as the Pauline epistles and the Johannine writings. These documents outline the key beliefs held by Christians about Jesus, including his divinity, humanity, and earthly life, and that he is the Christ and the Son of God. Despite their many shared beliefs, not all Christian denominations agree on all doctrines, and both major and minor differences on teachings and beliefs have persisted throughout Christianity for centuries. The New Testament states that the resurrection of Jesus is the foundation of the Christian faith (1 Corinthians 15:12–20). Christians believe that through his sacrificial death and resurrection, humans can be reconciled with God and are thereby offered salvation and the promise of eternal life. Recalling the words of John the Baptist on the day after Jesus' baptism, these doctrines sometimes refer to Jesus as the Lamb of God, who was crucified to fulfill his role as the servant of God. Jesus is thus seen as the new and last Adam, whose obedience contrasts with Adam's disobedience. Christians view Jesus as a role model, whose God-focused life believers are encouraged to imitate. Most Christians believe that Jesus was both human and the Son of God. While there has been theological debate over his nature,[t] Trinitarian Christians generally believe that Jesus is the Logos, God's incarnation and God the Son, both fully divine and fully human. However, the doctrine of the Trinity is not universally accepted among Christians. With the Protestant Reformation, Christians such as Michael Servetus and the Socinians started questioning the ancient creeds that had established Jesus' two natures. Nontrinitarian Christian groups include The Church of Jesus Christ of Latter-day Saints, Unitarians and Jehovah's Witnesses. Christians revere not only Jesus himself, but also his name. Devotions to the Holy Name of Jesus go back to the earliest days of Christianity. These devotions and feasts exist in both Eastern and Western Christianity. Judaism rejects the idea of Jesus being God, or a mediator to God, or part of a Trinity. It holds that Jesus is not the Messiah, arguing that he neither fulfilled the Messianic prophecies in the Tanakh nor embodied the personal qualifications of the Messiah. Jews argue that Jesus did not fulfill prophesies to build the Third Temple (Ezekiel 37:26–28), gather Jews back to Israel (Isaiah 43:5–6), bring world peace (Isaiah 2:4), and unite humanity under the God of Israel (Zechariah 14:9). Furthermore, according to Jewish tradition, there were no prophets after Malachi, who delivered his prophesies in the 5th century BC. Judaic criticism of Jesus is long-standing. The Talmud, written and compiled from the 3rd to the 5th century AD, includes stories that since medieval times have been considered to be defamatory accounts of Jesus. In one such story, Yeshu HaNozri ("Jesus the Nazarene"), a lewd apostate, is executed by the Jewish high court for spreading idolatry and practicing magic. The majority of contemporary scholars consider that this material provides no information on the historical Jesus. The Mishneh Torah, a late 12th-century work of Jewish law written by Moses Maimonides, states that Jesus is a "stumbling block" who makes "the majority of the world to err and serve a god other than the Lord". Medieval Hebrew literature contains the anecdotal "Episode of Jesus" (known also as Toledot Yeshu), in which Jesus is described as being the son of Joseph, the son of Pandera (see: Episode of Jesus). The account portrays Jesus as an impostor. A major figure in Islam, Jesus (commonly transliterated as ʾĪsā) is considered to be a messenger of God (Allah) and the Messiah (al-Masih) who was sent to guide the Children of Israel (Bani Isra'il) with a new scripture, the Gospel (referred to in Islam as Injil). Muslims regard the gospels of the New Testament as inauthentic, and believe that Jesus' original message was lost or altered and that Muhammad came later to restore it. Belief in Jesus (and all other messengers of God) is a requirement for being a Muslim. The Quran mentions Jesus by name 25 times—more often than Muhammad—and emphasizes that Jesus was a mortal human who, like all other prophets, had been divinely chosen to spread God's message. While the Qur'an affirms the Virgin birth of Jesus, he is considered to be neither the incarnation nor the son of God. Islamic texts emphasize a strict notion of monotheism (tawhid) and forbid the association of partners with God, which would be idolatry. Like all prophets in Islam, Jesus is considered a Muslim. The Quran describes the annunciation to Mary (Maryam) by an angel that she is to give birth to Jesus while remaining a virgin. It calls the virgin birth a miracle that occurred by the will of God. The Quran (21:91 and 66:12) states that God breathed his spirit into Mary while she was chaste. Jesus is called the "Spirit of God" because he was born through the action of the Spirit, but that belief does not imply his pre-existence. To aid in his ministry to the Jewish people, Jesus was given the ability to perform miracles, by permission of God rather than by his own power. Through his ministry, Jesus is seen as a precursor to Muhammad. According to the Quran, Jesus was not crucified but was merely made to appear that way to unbelievers by Allah, who physically raised Jesus into the heavens. To Muslims, it is the ascension rather than the crucifixion that constitutes a major event in the life of Jesus. Most Muslims believe that Jesus will return to earth at the end of time and defeat the Antichrist (ad-Dajjal) by killing him in Lud. The Ahmadiyya Muslim Community has several distinct teachings about Jesus. Ahmadis believe that he was a mortal man who survived his crucifixion and died a natural death at the age of 120 in Kashmir, India and is buried at Roza Bal. Bahá'í teachings consider Jesus to be a manifestation of God, a Bahá'í concept for prophets—intermediaries between God and humanity, serving as messengers and reflecting God's qualities and attributes. The Bahá'í concept emphasizes the simultaneous qualities of humanity and divinity; thus, it is similar to the Christian concept of incarnation. Bahá'í thought accepts Jesus as the Son of God. In Bahá'í thought, Jesus was a perfect incarnation of God's attributes, but Bahá'í teachings reject the idea that "ineffable essence" of the Divinity was contained within a single human body because of their beliefs regarding "omnipresence and transcendence of the essence of God". Bahá'u'lláh, the founder of the Bahá'í Faith, wrote that since each manifestation of God has the same divine attributes, they can be seen as the spiritual "return" of all previous manifestations of God, and the appearance of each new manifestation of God inaugurates a religion that supersedes the former ones, a concept known as progressive revelation. Bahá'ís believe that God's plan unfolds gradually through this process as mankind matures, and that some of the manifestations arrive in specific fulfillment of the missions of previous ones. Thus, Bahá'ís believe that Bahá'u'lláh is the promised return of Christ. Bahá'í teachings confirm many, but not all, aspects of Jesus as portrayed in the gospels. Bahá'ís believe in the virgin birth and in the Crucifixion, but see the Resurrection and the miracles of Jesus as symbolic. In Christian Gnosticism (now a largely extinct religious movement), Jesus was sent from the divine realm and provided the secret knowledge (gnosis) necessary for salvation. Most Gnostics believed that Jesus was a human who became possessed by the spirit of "the Christ" at his baptism. This spirit left Jesus' body during the crucifixion, but was rejoined to him when he was raised from the dead. Some Gnostics, however, were docetics, believed that Jesus did not have a physical body, but only appeared to possess one. Manichaeism, a Gnostic sect, accepted Jesus as a prophet, in addition to revering Gautama Buddha and Zoroaster. Some Hindus consider Jesus to be an avatar or a sadhu. Paramahansa Yogananda, an Indian guru, taught that Jesus was the reincarnation of Elisha and a student of John the Baptist, the reincarnation of Elijah. Some Buddhists, including Tenzin Gyatso, the 14th Dalai Lama, regard Jesus as a bodhisattva who dedicated his life to the welfare of people. The New Age movement entertains a wide variety of views on Jesus. Theosophists, from whom many New Age teachings originated, refer to Jesus as the Master Jesus, a spiritual reformer, and they believe that Christ, after various incarnations, occupied the body of Jesus. Scientologists recognize Jesus (along with other religious figures such as Zoroaster, Muhammad, and Buddha) as part of their "religious heritage". Atheists reject Jesus' divinity, but have differing views on Jesus' moral teachings. For example, Richard Dawkins has called him "a great moral teacher". Some of the earliest depictions of Jesus at the Dura-Europos church are firmly dated to before 256. Thereafter, despite the lack of biblical references or historical records, a wide range of depictions of Jesus appeared during the last two millennia, often influenced by cultural settings, political circumstances and theological contexts. As in other Early Christian art, the earliest depictions date to the late 2nd or early 3rd century, and surviving images are found especially in the Catacombs of Rome. The depiction of Christ in pictorial form was highly controversial in the early church. [u] From the 5th century onward, flat painted icons became popular in the Eastern Church. The Byzantine Iconoclasm acted as a barrier to developments in the East, but by the ninth century, art was permitted again. The Protestant Reformation brought renewed resistance to imagery, but total prohibition was atypical, and Protestant objections to images have tended to reduce since the 16th century. Although large images are generally avoided, few Protestants now object to book illustrations depicting Jesus. The use of depictions of Jesus is advocated by the leaders of denominations such as Anglicans and Catholics and is a key element of the Eastern Orthodox tradition. The Transfiguration was a major theme in Eastern Christian art, and every Eastern Orthodox monk who had trained in icon painting had to prove his craft by painting an icon depicting it. Icons receive the external marks of veneration, such as kisses and prostration, and they are thought to be powerful channels of divine grace. The Renaissance brought forth a number of artists who focused on depictions of Jesus; Fra Angelico and others followed Giotto in the systematic development of uncluttered images. Jesus appears as an infant in a manger (feed trough) in Christmas creches, which depict the Nativity scene. He is typically joined by Mary, Joseph, animals, shepherds, angels, and the Magi. Francis of Assisi (1181/82–1226) is credited with popularizing the creche, although he probably did not initiate it. The creche reached its height of popularity in the 17th and 18th centuries in southern Europe. The Shroud of Turin (Italy) is the best-known claimed relic of Jesus and one of the most studied artifacts in human history. However, throughout the history of Christianity a number of relics attributed to Jesus have been claimed, although doubt has been cast on them. The 16th-century Catholic theologian Erasmus wrote sarcastically about the proliferation of relics and the number of buildings that could have been constructed from the wood claimed to be from the cross used in the Crucifixion. Similarly, while experts debate whether Jesus was crucified with three nails or with four, at least thirty holy nails continue to be venerated as relics across Europe. Some relics, such as purported remnants of the Crown of Thorns, receive only a modest number of pilgrims, while the Shroud of Turin (which is associated with an approved Catholic devotion to the Holy Face of Jesus), has received millions, including popes John Paul II and Benedict XVI. ^ James Dunn writes that the baptism and crucifixion of Jesus "command almost universal assent" and "rank so high on the 'almost impossible to doubt or deny' scale of historical facts" that they are often the starting points for the study of the historical Jesus. Bart Ehrman states that the crucifixion of Jesus on the orders of Pontius Pilate is the most certain element about him. John Dominic Crossan and Richard G. Watts state that the crucifixion of Jesus is as certain as any historical fact can be. Paul R. Eddy and Gregory A. Boyd say that non-Christian confirmation of the crucifixion of Jesus is now "firmly established". ^ The New Testament records a variety of names and titles accorded to Jesus. ^ a b In a 2011 review of the state of modern scholarship, Bart Ehrman wrote, "He certainly existed, as virtually every competent scholar of antiquity, Christian or non-Christian, agrees". Richard A. Burridge states: "There are those who argue that Jesus is a figment of the Church's imagination, that there never was a Jesus at all. I have to say that I do not know any respectable critical scholar who says that any more". Robert M. Price does not believe that Jesus existed, but agrees that this perspective runs against the views of the majority of scholars. James D. G. Dunn calls the theories of Jesus' non-existence "a thoroughly dead thesis". Michael Grant (a classicist) wrote in 1977, "In recent years, 'no serious scholar has ventured to postulate the non historicity of Jesus' or at any rate very few, and they have not succeeded in disposing of the much stronger, indeed very abundant, evidence to the contrary". Robert E. Van Voorst states that biblical scholars and classical historians regard theories of non-existence of Jesus as effectively refuted. ^ This article uses quotes from the New Revised Standard Version of the Bible. ^ Compare Matthew 1:6–16 with Luke 3:23–31. See also Genealogy of Jesus § Comparison of the two genealogies. ^ For an overview of such theories, see Genealogy of Jesus § Explanations for divergence. ^ Amy-Jill Levine writes: "There is a consensus of sorts on a basic outline of Jesus' life. Most scholars agree that Jesus was baptized by John, debated with fellow Jews on how best to live according to God's will, engaged in healings and exorcisms, taught in parables, gathered male and female followers in Galilee, went to Jerusalem, and was crucified by Roman soldiers during the governorship of Pontius Pilate"
^ In the New Testament, Jesus is described as Jewish / Judean (Ioudaios as written in Koine Greek) on three occasions: by the Magi in Matthew 2, who referred to Jesus as "King of the Jews" (basileus ton ioudaion); by both the Samaritan woman at the well and by Jesus himself in John 4; and (in all four gospels) during the Passion, by the Romans, who also used the phrase "King of the Jews". ^ Ehrman writes: ""In simpler terms, the historical Jesus did not exist. Or if he did, he had virtually nothing to do with the founding of Christianity." further quoting as authoritative the fuller definition provided by Earl Doherty in Jesus: Neither God Nor Man. Age of Reason, 2009, pp. vii–viii: it is "the theory that no historical Jesus worthy of the name existed, that Christianity began with a belief in a spiritual, mythical figure, that the Gospels are essentially allegory and fiction, and that no single identifiable person lay at the root of the Galilean preaching tradition." ^ Following the Apostolic Age, there was fierce and often politicized debate in the early church on many interrelated issues. Christology was a major focus of these debates, and was addressed at every one of the first seven ecumenical councils. Some early beliefs viewed Jesus as ontologically subordinate to the Father (Subordinationism), and others considered him an aspect of the Father rather than a separate person (Sabellianism), both were condemned as heresies by the Catholic Church. The Church resolved the issues in ancient councils, which established the Holy Trinity, with Jesus both fully human and fully God. ^ Flavius Josephus writing (about 5 years later, c. AD 75) in The Jewish War (Book VII 1.1) stated that Jerusalem had been flattened to the point that "there was left nothing to make those that came thither believe it had ever been inhabited." And once what was left of the ruins of Jerusalem had been turned into the Roman settlement of Aelia Capitolina, no Jews were allowed to set foot in it. ^ Polarized conclusions regarding the Shroud of Turin remain. According to former Nature editor Philip Ball, "it's fair to say that, despite the seemingly definitive tests in 1988, the status of the Shroud of Turin is murkier than ever. Not least, the nature of the image and how it was fixed on the cloth remain deeply puzzling". ^ Rahner 2004, p. 732. ^ Sanders 1993, pp. 10–11. ^ a b c Humphreys, Colin J.; Waddington, W. G. (1992). "The Jewish Calendar, a Lunar Eclipse and the Date of Christ's Crucifixion" (PDF). Tyndale Bulletin. 43 (2): 340. ^ a b c d Dunn 2003, p. 339. ^ Ehrman 1999, p. 101. ^ Crossan & Watts 1999, p. 96. ^ Eddy & Boyd 2007, p. 173. ^ a b Theissen & Merz 1998. ^ a b c d Vermes, Geza (1981). Jesus the Jew: A Historian's Reading of the Gospels. Philadelphia: First Fortress. pp. 20, 26, 27, 29. ISBN 978-0-8006-1443-0. ^ a b c d McGrath 2006, pp. 4–6. ^ Ehrman, Bart (2011). Forged: writing in the name of God – Why the Bible's Authors Are Not Who We Think They Are. HarperCollins. p. 285. ISBN 978-0-06-207863-6. ^ Price, Robert M. (2009). "Jesus at the Vanishing Point". In Beilby, James K.; Eddy, Paul R. The Historical Jesus: Five Views. InterVarsity. pp. 55, 61. ISBN 978-0-8308-7853-6. ^ Van Voorst 2000, p. 16. ^ Powell 1998, pp. 168–73. ^ Sanders 1993, p. 57. ^ a b c James Orr, ed. (1939). "International Standard Bible Encyclopedia Online". Wm. B. Eerdmans Publishing Co.
^ a b c d Levine 2006, p. 4. ^ Charlesworth, James H. (2008). The Historical Jesus: An Essential Guide. p. 113. ISBN 978-1-4267-2475-6. ^ a b c d Sanders 1993, p. 11. ^ Sanders 1993, pp. 11, 14. ^ BBC Team (February 8, 2005). "History of Judaism 63 BCE–1086 CE". BBC Religion & Ethics. British Broadcasting Corporation. Retrieved April 20, 2016. ^ Grudem 1994, pp. 568–603. ^ Wilhelm, Joseph (1911). "The Nicene Creed". The Catholic Encyclopedia. 11. Robert Appleton Company. ^ a b Metzger, Bruce M.; Coogan, Michael D. (1993). Oxford Companion to the Bible. Oxford University Press. p. 649. ISBN 978-0-19-974391-9. ^ Tabor, James (2013-03-22). "What the Bible Says About Death, Afterlife, and the Future". UNCC. ^ Hoekema, Anthony A. (1994). The Bible and the Future. Eerdmans Publishing. pp. 88–89. ISBN 978-0-85364-624-2. ^ Garrett, James L. (2014). Systematic Theology, Volume 2, Second Edition: Biblical, Historical, and Evangelical. Wipf and Stock Publishers. p. 766. ISBN 978-1-62564-852-5. ^ a b "Quran 3:46–158". Archived from the original on May 1, 2015. ^ a b c Glassé, Cyril (2008). Concise Encyclopedia of Islam. Rowman & Littlefield. pp. 270–71. ISBN 978-0-7425-6296-7. ^ a b Siddiqui, Mona (2013). Christians, Muslims, and Jesus. Yale University Press. ISBN 978-0-300-16970-6. ^ a b Morgan, Diane (2010). Essential Islam: A Comprehensive Guide to Belief and Practice. ABC-CLIO. pp. 45–46. ISBN 978-0-313-36025-1. ^ a b c Jacobs, Joseph; Kohler, Kaufmann; Gottheil, Richard; Krauss, Samuel. "Jesus of Nazareth". Jewish Encyclopedia. ^ a b c d e f g h i j k l m n Sanders, Ed P.; Pelikan, Jaroslav J. "Jesus Christ". Encyclopædia Britannica. Retrieved June 10, 2015. ^ a b Maas, Anthony J. (1913). "Origin of the Name of Jesus Christ" . In Herbermann, Charles. Catholic Encyclopedia. New York: Robert Appleton Company. ^ Sumner, Paul. "The Hebrew Meaning of "Jesus"". Retrieved 31 March 2019. ^ Ehrman, Bart D. (2012). Did Jesus Exist? : The Historical Argument for Jesus of Nazareth. HarperOne. p. 29. ISBN 978-0-06-208994-6. ^ New American Bible Numbers 13:16 commentary Joshua: in Hebrew, "Jehoshua," which was later modified to "Jeshua," the Hebrew pronunciation of the name "Jesus." Hoshea and Joshua are variants of one original name meaning "the LORD saves." ^ New American Bible Matthew 1:21 commentary Jesus: in first-century Judaism the Hebrew name Joshua (Greek Iesous) meaning "Yahweh helps" was interpreted as "Yahweh saves." ^ Rogers, Cleon (1999). Topical Josephus. Zondervan. p. 12. ISBN 978-0-310-23017-5. ^ Eddy & Boyd 2007, p. 129. ^ France 2007, p. 53. ^ Doninger 1999, p. 212. ^ Pannenberg 1968, pp. 30–31. ^ Heil, John P. (2010). Philippians: Let Us Rejoice in Being Conformed to Christ. Society of Biblical Lit. p. 66. ISBN 978-1-58983-482-8. ^ Gwynn, Murl E. (2011). Conflict: Christianity's Love Vs. Islam's Submission. iUniverse. p. 92. ISBN 978-1-4620-3484-0. ^ Vine 1940, pp. 274–75. ^ Mills & Bullard 1998, p. 142. ^ Blomberg 2009, pp. 441–42. ^ a b c d Fahlbusch, Erwin (2005). The Encyclopedia of Christianity. 4. Wm. B. Eerdmans Publishing. pp. 53–56. ISBN 978-0-8028-2416-5. ^ a b c Evans 2003, pp. 465–77. ^ Rausch 2003, p. 77. ^ a b c Evans 2003, pp. 521–30. ^ Brown 1997, pp. 835–40. ^ Cross & Livingstone 2005, John, St..
^ Graham N. Stanton (8 July 2004). Jesus and Gospel. Cambridge University Press. p. 192. ISBN 978-0-521-00802-0. ^ J.W. Rogerson; Judith M. Lieu (16 March 2006). The Oxford Handbook of Biblical Studies. Oxford University Press. p. 437. ISBN 978-0-19-925425-5. ^ a b c d Sanders 1993, p. 3. ^ Grudem 1994, pp. 90–91. ^ a b Köstenberger, Kellum & Quarles 2009, pp. 117–25. ^ a b Ehrman 1999, pp. 22–23. ^ Sanders 1993, p. 71. ^ a b c d Theissen & Merz 1998, pp. 17–62. ^ Roberts, Mark D. (2007). Can We Trust the Gospels? : Investigating the Reliability of Matthew, Mark, Luke, and John. Crossway. p. 58. ISBN 978-1-4335-1978-9. ^ Licona 2010, pp. 210–21. ^ a b Scroggie, W. Graham (1995). A Guide to the Gospels. Kregel Publications. p. 128. ISBN 978-0-8254-9571-7. ^ Ladd, George E. (1993). A Theology of the New Testament. Wm. B. Eerdmans Publishing. p. 251. ISBN 978-0-8028-0680-2. ^ a b c d e f g h i j k l m n Witherington 1997, p. 113. ^ a b Metzger, Paul L. (2010). The Gospel of John: When Love Comes to Town. InterVarsity Press. p. 281. ISBN 978-0-8308-3641-3. ^ a b c d e Harris 1985, pp. 302–10. ^ a b Rahner 2004, pp. 730–31. ^ a b c Sanders 1993, pp. 80–91. ^ Brown 1978, p. 163. ^ France, R.T. (1985). The Gospel According to Matthew: An Introduction and Commentary. Eerdmans. p. 72. ISBN 978-0-8028-0063-3. "From David the two lists diverge, as Matthew follows the line of succession to the throne of Judah from Solomon, whereas Luke's list goes through Nathan, ... and converges with Matthew's only for the two names of Shealtiel and Zerubabbel until Joseph is reached." ^ Mills & Bullard 1998, p. 556. ^ a b c Marsh, Clive; Moyise, Steve (2006). Jesus and the Gospels. Clark International. p. 37. ISBN 978-0-567-04073-2. ^ Morris 1992, p. 26. ^ a b c Jeffrey, David L. (1992). A Dictionary of biblical tradition in English literature. Wm. B. Eerdmans Publishing. pp. 538–40. ISBN 978-0-85244-224-1. ^ Cox & Easley 2007, pp. 30–37. ^ Andrew T.Lincoln, 'Luke and Jesus' Conception: A Case of Double Paternity?,' Journal of Biblical Literature, Vol. 132, No. 3 (2013), pp. 639–58. ^ a b c Harris 1985, pp. 272–85. ^ Schnackenburg, Rudolf (2002). The Gospel of Matthew. Wm.B. Eerdmans Publishing. pp. 9–11. ISBN 978-0-8028-4438-5. ^ Aslan, Reza (2013). Zealot: The Life and Times of Jesus of Nazareth. Random House. p. 756. ISBN 978-1-4000-6922-4. ^ a b c d e Harris 1985, pp. 270–72. ^ Dickson 2008, pp. 68–69. ^ Evans, Craig A. (2001). "Context, family and formation". In Bockmuehl, Markus N.A. Cambridge companion to Jesus. Cambridge University Press. pp. 14, 21. ISBN 978-0-521-79678-1. ^ a b c Blomberg 2009, pp. 224–29. ^ Köstenberger, Kellum & Quarles 2009, pp. 141–43. ^ a b McGrath 2006, pp. 16–22. ^ a b Zanzig, Thomas (2000). Jesus of history, Christ of faith. Saint Mary's Press. p. 118. ISBN 978-0-88489-530-5. ^ a b c d Lee 2004, pp. 21–30. ^ Sheen, Fulton J. (2008). Life of Christ. Random House. p. 65. ISBN 978-0-385-52699-9. ^ a b c d e Cross & Livingstone 2005, Jesus Christ. ^ Boring & Craddock 2004, p. 292. ^ a b c d Harris 1985, pp. 285–96. ^ a b Redford 2007, pp. 117–30. ^ Redford 2007, pp. 143–60. ^ Nash, Henry S. (1909). "Transfiguration, The". In Jackson, Samuel M. The New Schaff-Herzog Encyclopedia of Religious Thought: Son of Man-Tremellius V11. Funk & Wagnalls Company. p. 493. ISBN 978-1-4286-3189-2. ^ Cox & Easley 2007, p. 137. ^ Redford 2007, pp. 211–29. ^ a b c d e f Cox & Easley 2007, pp. 155–70. ^ Redford 2007, pp. 257–74. ^ Brown 1988, pp. 25–27. ^ Boring & Craddock 2004, pp. 292–93. ^ Patella, Michael F. (2009). "The Gospel According to Luke". In Durken, Daniel. New Collegeville Bible Commentary: New Testament. Liturgical Press. p. 255. ISBN 978-0-8146-3260-4. ^ Theissen & Merz 1998, pp. 316–46. ^ Stassen, Glen H.; Gushee, David P. (2003). Kingdom Ethics: Following Jesus in Contemporary Context. InterVarsity Press. pp. 102–03, 138–40, 197–98, 295–98. ISBN 978-0-8308-2668-1. ^ Lisco, Friedrich G. (1850). The Parables of Jesus. Daniels and Smith Publishers. pp. 9–11. ^ Oxenden, Ashton (1864). The parables of our Lord?. William Macintosh Publishers. p. 6. ^ Blomberg, Craig L. (2012). Interpreting the Parables. InterVarsity Press. p. 448. ISBN 978-0-8308-3967-4. ^ Boucher, Madeleine I. "The Parables". BBC. Retrieved June 3, 2013. ^ Green, McKnight & Marshall 1992, p. 299. ^ Twelftree 1999, p. 350. ^ Theissen & Merz 1998, p. 298. ^ Green, McKnight & Marshall 1992, p. 300. ^ Sanders, Ed P.; Pelikan, Jaroslav J. "Jesus Christ". Encyclopædia Britannica. Retrieved June 10, 2015. ^ Hindson, Edward E.; Mitchell, Daniel R. (2010). Zondervan King James Version Commentary: New Testament. Zondervan. p. 100. ISBN 978-0-310-25150-7. ^ a b Achtemeier, Paul J.; Green, Joel B.; Thompson, Marianne M. (2001). Introducing the New Testament: Its Literature and Theology. Wm. B. Eerdmans Publishing. p. 198. ISBN 978-0-8028-3717-2. ^ Ehrman, Bart D. (2009). Jesus, Interrupted: Revealing the Hidden Contradictions in the Bible (And Why We Don't Know About Them). HarperCollins. p. 84. ISBN 978-0-06-186328-8. ^ Twelftree 1999, p. 236. ^ van der Loos, Hendrik (1965). The Miracles Of Jesus. Brill. p. 197. ^ Pentecost, J. Dwight (1981). The words and works of Jesus Christ. Zondervan. p. 212. ISBN 978-0-310-30940-6. ^ Twelftree 1999, p. 95. ^ Donahue & Harrington 2002, p. 182. ^ Cross & Livingstone 2005, John, Gospel of. ^ Donahue & Harrington 2002, p. 336. ^ Yieh, John Y. H. (2004). One teacher: Jesus' teaching role in Matthew's gospel. Walter de Gruyter. pp. 240–41. ISBN 978-3-11-018151-7. ^ Pannenberg 1968, pp. 53–54. ^ Lee 2004, pp. 72–76. ^ a b Boring & Craddock 2004, pp. 256–58. ^ Majerník, Ponessa & Manhardt 2005, pp. 133–34. ^ a b Evans 2003, pp. 381–95. ^ Lockyer, Herbert (1988). All the Apostles of the Bible. Zondervan. pp. 106–11. ISBN 978-0-310-28011-8. ^ Funk & Hoover 1993, pp. 401–70. ^ Cox & Easley 2007, pp. 180–91. ^ a b Cox & Easley 2007, p. 182. ^ Cross & Livingstone 2005, Eucharist. ^ Pohle, Joseph (1913). "The Blessed Eucharist as a Sacrament" . In Herbermann, Charles. Catholic Encyclopedia. New York: Robert Appleton Company. ^ Freedman 2000, p. 792. ^ a b Walvoord & Zuck 1983, pp. 83–85. ^ Cross & Livingstone 2005, Jesus. ^ Michaels, J. Ramsey (211). John (Understanding the Bible Commentary Series). Baker Books. p. 187. ISBN 978-1-4412-3659-3. ^ Brown 1997, p. 146. ^ Bromiley, Geoffrey W. (1988). International Standard Bible Encyclopedia: E–J. Wm. B. Eerdmans Publishing. pp. 1050–52. ISBN 978-0-8028-3782-0. ^ a b c d Evans 2003, pp. 487–500. ^ a b c Blomberg 2009, pp. 396–400. ^ Evans 2003, p. 495. ^ Blomberg 2009, pp. 396–98. ^ a b Niswonger 1992, p. 172. ^ Majerník, Ponessa & Manhardt 2005, p. 181. ^ a b Carter 2003, pp. 120–21. ^ Blomberg 2009, pp. 400–01. ^ Brown 1988, p. 93. ^ Blomberg 2009, p. 402. ^ a b c d e f g Evans 2003, pp. 509–20. ^ a b Köstenberger, Kellum & Quarles 2009, pp. 211–14. ^ a b Doninger 1999, p. 271. ^ Ehrman, Bart D. (2009). Jesus, Interrupted: Revealing the Hidden Contradictions in the Bible (And Why We Don't Know About Them). HarperCollins. p. 82. ISBN 978-0-06-186328-8. ^ Köstenberger, Kellum & Quarles 2009, pp. 213–14. ^ Morris 1992, p. 727. ^ Harris 1985, pp. 308–09. ^ Harris 1985, pp. 297–301. ^ Cox & Easley 2007, pp. 216–26. ^ Frederick F., Bruce (1990). The Acts of the Apostles. Wm. B. Eerdmans Publishing. p. 210. ISBN 978-0-8028-0966-7. ^ Van den Biesen, Christian (1913). "Apocalypse" . In Herbermann, Charles. Catholic Encyclopedia. New York: Robert Appleton Company. ^ Catholic Encyclopedia: Proselyte: "The English term "proselyte" occurs only in the New Testament where it signifies a convert to the Jewish religion (Matthew 23:15; Acts 2:11; 6:5; etc. ), though the same Greek word is commonly used in the Septuagint to designate a foreigner living in Palestine. Thus the term seems to have passed from an original local and chiefly political sense, in which it was used as early as 300 BC, to a technical and religious meaning in the Judaism of the New Testament epoch." ^ Ehrman 2012, pp. 87–90. ^ Jaeger, Werner (1961). Early Christianity and Greek Paideia. Harvard University Press. pp. 6, 108–09. ISBN 978-0-674-22052-2. Retrieved 26 February 2015. ^ Fee, Gordon; Stuart, Douglas (2014). How to Read the Bible for All Its Worth: Fourth Edition. Zondervan. ISBN 978-0-310-51783-2. ^ Bart D. Ehrman (1997). The New Testament: A Historical Introduction to the Early Christian Writings. Oxford University Press. p. 8. ISBN 978-0-19-508481-8. The New Testament contains twenty-seven books, written in Greek, by fifteen or sixteen different authors, who were addressing other Christian individuals or communities between the years 50 and 120 C.E. (see box 1.4). As we will see, it is difficult to know whether any of these books was written by Jesus' own disciples. ^ Levine 2006, p. 5. ^ Powell 1998, pp. 19–23. ^ a b Chilton & Evans 1998, p. 27. ^ Evans 2012, pp. 4–5. ^ Theissen & Winter 2002, pp. 142–43. ^ Anderson, Paul N.; Just, Felix; Thatcher, Tom (2007). John, Jesus, and History, Volume 1: Critical Appraisals of Critical Views. Society of Biblical Lit. p. 131. ISBN 978-1-58983-293-0. ^ Meier 2006, p. 124. ^ a b Blomberg 2009, pp. 431–36. ^ a b c Harris 1985, p. 263. ^ Rausch 2003, pp. 36–37. ^ Anderson, Paul N.; Just, Felix; Thatcher, Tom (2007). John, Jesus, and History, Volume 2. Society of Biblical Lit. p. 291. ISBN 978-1-58983-293-0. ^ Anderson, Paul N.; Just, Felix; Thatcher, Tom (2007). John, Jesus, and History, Volume 2. Society of Biblical Lit. p. 292. ISBN 978-1-58983-293-0. ^ Funk & Hoover 1993, pp. 471–532. ^ Van Voorst 2000, pp. 39–53. ^ Van Voorst 2000, p. 83. ^ Maier, Paul L. (1995). Josephus, the essential works: a condensation of Jewish antiquities and The Jewish war. p. 285. ISBN 978-0-8254-3260-6. ^ Evans, Craig A. (2001). Jesus and His Contemporaries: Comparative Studies. Brill. p. 42. ISBN 978-0-391-04118-9. ^ Reed 2002, p. 18. ^ Charlesworth, James H., ed. (2006). "Jesus and Archaeology". Jesus and archaeology. Wm. B. Eerdmans Publishing. p. 127. ISBN 978-0-8028-4880-2. ^ Maier 1989, pp. 115–18. ^ a b Niswonger 1992, pp. 121–22. ^ Köstenberger, Kellum & Quarles 2009, pp. 137–38. ^ Niswonger 1992, pp. 122–24. ^ a b Vermes, Géza (2010). The Nativity: History and Legend. Random House Digital. pp. 81–82. ISBN 978-0-307-49918-9. ^ Dunn 2003, p. 324. ^ a b Köstenberger, Kellum & Quarles 2009, p. 140. ^ a b Freedman 2000, p. 249. ^ Maier 1989, pp. 120–21. ^ Maier 1989, p. 123. ^ Evans, Craig (2006). "Josephus on John the Baptist". In Levine, Amy-Jill; Allison, Dale C.; Crossan, John D. The Historical Jesus in Context. Princeton University Press. pp. 55–58. ISBN 978-0-691-00992-6. ^ Köstenberger, Kellum & Quarles 2009, p. 398. ^ Theissen & Merz 1998, pp. 81–83. ^ Green, Joel B. (1997). The gospel of Luke: New International Commentary on the New Testament Series. Wm. B. Eerdmans Publishing. p. 168. ISBN 978-0-8028-2315-1. ^ Carter 2003, pp. 44–45. ^ Köstenberger, Kellum & Quarles 2009, pp. 398–400. ^ Barnett, Paul (2002). Jesus & the Rise of Early Christianity: A History of New Testament Times. InterVarsity Press. p. 21. ISBN 978-0-8308-2699-5. ^ Pratt, J. P. (1991). "Newton's Date for the Crucifixion". Journal of the Royal Astronomical Society. 32: 301–04. Bibcode:1991QJRAS..32..301P. ^ Brown, Raymond E. (1978). Mary in the New Testament. Paulist Press. p. 64. ISBN 978-0-8091-2168-7. ^ a b Theissen & Merz 1998, p. 194. ^ Cross, & Livingstone 2005, James, St..
^ Vermes 1981, p. 283. ^ Sanders 1993, pp. 85–88. ^ Theissen & Merz 1998, p. 196. ^ Funk, Robert W. and the Jesus Seminar. The acts of Jesus: the search for the authentic deeds of Jesus. HarperSanFrancisco. 1998. "Birth & Infancy Stories" pp. 497–526. ^ Powell 1998, p. 47. ^ Murphy, Catherine (2003). John the Baptist: Prophet of Purity for a New Age. Liturgical Press. pp. 29–30. ISBN 978-0-8146-5933-5. ^ Theissen & Merz 1998, p. 235. ^ Borg, Marcus J. (2006). "The Spirit-Filled Experience of Jesus". In Dunn, James D.G. ; McKnight, Scot. The Historical Jesus in Recent Research. Eisenbrauns. p. 303. ISBN 978-1-57506-100-9. ^ Sanders 1993, pp. 205–23. ^ Ehrman 1999, pp. 167–70. ^ a b Ehrman 1999, pp. 164–67. ^ Ehrman 1999, pp. 171–76. ^ Theissen & Merz 1998, p. 310. ^ a b Sanders 1993, p. 10. ^ a b c d e Ehrman 1999, pp. 186–87. ^ a b c Sanders 1993, pp. 123–24. ^ Sanders 1993, pp. 230–36. ^ Theissen & Merz 1998, p. 336. ^ Cross & Livingstone 2005, Messiah. ^ a b Theissen & Merz 1998, pp. 533–40. ^ Ehrman, Bart (December 1, 2015). "Judas and the Messianic Secret". The Bart Ehrman Blog. ^ Ehrman, Bart (December 1, 2015). "Jesus' Claim to be the Messiah". The Bart Ehrman Blog. ^ Sanders 1993, pp. 254–62. ^ Sanders 1993, pp. 263–64. ^ Theissen & Merz 1998, pp. 465–66. ^ Sanders 1993, pp. 269–73. ^ Meier 2006, pp. 126–28. ^ Sanders 1993, pp. 276–81. ^ Theissen & Winter 2002, pp. 4–5. ^ Theissen & Winter 2002, p. 5. ^ Cross & Livingstone 2005, Historical Jesus, Quest of the. ^ Theissen & Merz 1998, pp. 1–15. ^ Mitchell, Margaret M.; Young, Frances M. (2006). The Cambridge History of Christianity. 1. Cambridge University Press. p. 23. ISBN 978-0-521-81239-9. ^ Köstenberger, Kellum & Quarles 2009, pp. 124–25. ^ Brown, Colin (2011). "Why Study the Historical Jesus?". In Holmen, Tom; Porter, Stanley E. Handbook for the Study of the Historical Jesus. Brill. p. 1416. ISBN 978-90-04-16372-0. ^ a b c d Houlden 2006, pp. 63–99. ^ Green, McKnight & Marshall 1992, p. 442. ^ Barr, James (1970). "Which language did Jesus speak". Bulletin of the John Rylands University Library of Manchester. 53 (1): 9–29. ^ Dunn 2003, pp. 313–15. ^ Ehrman 1999, p. 96. ^ Mason, Steve (2007). "Jews, Judaeans, Judaizing, Judaism: Problems of Categorization in Ancient History" (PDF). Journal for the Study of Judaism. 38 (4): 457–512. doi:10.1163/156851507X193108. Archived from the original (PDF) on March 25, 2015. ^ Levine 2006, p. 10. ^ Gibson, David (February 21, 2004). "What Did Jesus Really Look Like?". New York Times. ^ Theissen & Merz 1998, pp. 113–15. ^ a b c Theissen & Merz 1998, p. 90. ^ Watson, Francis (2001). "The quest for the real Jesus". In Bockmuehl, Markus N.A. Cambridge companion to Jesus. Cambridge University Press. pp. 156–57. ISBN 978-0-521-79678-1. ^ Schreiner, Thomas R. (2008). New Testament Theology: Magnifying God in Christ. Baker Academic. pp. 23–37. ISBN 978-0-8010-2680-5. ^ Cross & Livingstone 2005, Great Schism. ^ "The Letter of Paul to the Corinthians". Encyclopædia Britannica. Retrieved June 26, 2013. ^ Pannenberg, Wolfhart (2004). Systematic Theology. 2. Continuum. pp. 297–303. ISBN 978-0-567-08466-8. ^ a b Cross & Livingstone 2005, Antitrinitarianism. ^ Joyce, George H. (1913). "Blessed Trinity" . In Herbermann, Charles. Catholic Encyclopedia. New York: Robert Appleton Company. ^ a b Houlden 2006, p. 426. ^ Kessler, Ed. "Jesus the Jew". BBC. Retrieved June 18, 2013. ^ Norman, Asher (2007). Twenty-six reasons why Jews don't believe in Jesus. Feldheim Publishers. pp. 59–70. ISBN 978-0-9771937-0-7. ^ Simmons, Rabbi Shraga, "Why Jews Don't Believe in Jesus". Accessed December 22, 2011. ^ Simmons, Shraga (March 6, 2004). "Why Jews Do not Believe in Jesus". Aish.com. ^ "Malachi, Book of". Jewish Encyclopedia. Retrieved July 3, 2013. ^ Kessler, Edward; Wenborn, Neil (2005). A Dictionary of Jewish-Christian Relations. Cambridge University Press. p. 416. ISBN 978-1-139-44750-8. ^ Theissen & Merz 1998, pp. 74–75. ^ Jeffrey, Grant R. (2009). Heaven: The Mystery of Angels. Random House Digital. p. 108. ISBN 978-0-307-50940-6. ^ Adam Sutcliffe (10 November 2005). Judaism and Enlightenment. Cambridge University Press. pp. 141–. ISBN 978-0-521-67232-0. ^ Esposito, John L. (2003). The Oxford Dictionary of Islam. Oxford University Press. p. 158. ISBN 978-0-19-975726-8. ^ Paget, James C. (2001). "Quests for the historical Jesus". In Bockmuehl, Markus N.A. Cambridge companion to Jesus. Cambridge University Press. p. 183. ISBN 978-0-521-79678-1. ^ "Jesus, Son of Mary". Oxford Islamic Studies Online. Retrieved July 3, 2013. ^ Aboul-Enein, Youssef H. (2010). Militant Islamist Ideology: Understanding the Global Threat. Naval Institute Press. p. 20. ISBN 978-1-61251-015-6. ^ George, Timothy (2002). Is the Father of Jesus the God of Muhammad? : Understanding the Differences Between Christianity and Islam. Zondervan. pp. 150–51. ISBN 978-0-310-24748-7. ^ Shedinger, Robert F. (2009). Was Jesus a Muslim? : Questioning Categories in the Study of Religion. Fortress Press. p. ix. ISBN 978-1-4514-1727-2. ^ a b c Burns, Robert A. (2011). Christianity, Islam, and the West. University Press of America. p. 32. ISBN 978-0-7618-5560-6. ^ a b Peters, F. E. (2003). Islam: A Guide for Jews and Christians. Princeton University Press. p. 23. ISBN 978-0-691-11553-5. ^ Cooper, Anne; Maxwell, Elsie A. (2003). Ishmael My Brother: A Christian Introduction To Islam. Monarch Books. p. 59. ISBN 978-0-8254-6223-8. ^ "The Quranic Arabic Corpus – Translation". Corpus.quran.com. Retrieved May 20, 2016. ^ Religions of the World: A Comprehensive Encyclopedia of Beliefs and Practices. ABC-CLIO. 2010-09-21. p. 55. ISBN 978-1-59884-203-6. ^ a b c Stockman, Robert (1992). "Jesus Christ in the Bahá'í Writings". Bahá'í Studies Review. 2 (1). ^ a b c Cole, Juan (1982). "The Concept of Manifestation in the Bahá'í Writings". Bahá'í Studies. 9: 1–38. ^ Smith, Peter (2008). An Introduction to the Baha'i Faith. Cambridge University Press. p. 128. ISBN 978-0-521-86251-6. ^ Lepard, Brian D. (2008). In the Glory of the Father: The Bahai Faith and Christianity. Bahai Publishing. p. 118. ISBN 978-1-931847-34-6. ^ McManners, John (2001). The Oxford Illustrated History of Christianity. Oxford University Press. p. 27. ISBN 978-0-19-285439-1. ^ Ehrman, Bart D. (2003). Lost Christianities: The Battles For Scripture And The Faiths We Never Knew. Oxford University Press. pp. 124–25. ISBN 978-0-19-518249-1. ^ Rishi Das, Shaunaka (March 24, 2009). "Jesus in Hinduism". BBC. ^ Yogananda, Paramahansa (2008). Autobiography of a Yogi. Diamond Pocket Books. ISBN 978-81-902562-0-9. ^ Beverley, James A. (June 11, 2011). "Hollywood's Idol". Christianity Today. ^ a b Hutson, Steven (2006). What They Never Taught You in Sunday School: A Fresh Look at Following Jesus. City Boy Enterprises. p. 57. ISBN 978-1-59886-300-0. ^ Pike, Sarah M. (2004). New Age and neopagan religions in America. Columbia University Press. p. 56. ISBN 978-0-231-12402-7. ^ Bailey, Alice; Khul, Djwhal (2005). A Treatise on Cosmic Fire. Lucis Publishing Company. pp. 678, 1150, 1193. ISBN 978-0-85330-117-2. ^ "What Is Scientology's View of Moses, Jesus, Muhammad, The Buddha and Other Religious Figures of the Past?". Church of Scientology International. Retrieved June 13, 2013. ^ Dawkins, Richard (2008-01-16). The God Delusion. Houghton Mifflin Harcourt. p. 284. ISBN 978-0-547-34866-7. Retrieved December 13, 2014. ^ "Dura-Europos: Excavating Antiquity | Yale University Art Gallery". media.artgallery.yale.edu. ^ Gutmann, Joseph (1992). "Early Christian and Jewish Art". In Attridge, Harold W.; Hata, Gohei. Eusebius, Christianity, and Judaism. Wayne State University Press. pp. 283–84. ISBN 978-0-8143-2361-8. ^ Schaff, Phillip (July 1, 2006). History of the Christian Church,8 volumes, 3rd edition. Massachusetts: Hendrickson Publishers. ISBN 978-1-56563-196-0. ^ a b Cross & Livingstone 2005, Icons. ^ Wojtyła, Karol J. "General audience 29 October 1997". Vatican Publishing House. Retrieved April 20, 2013. ^ Ratzinger, Joseph A. "General audience 6 May 2009". Vatican Publishing House. Retrieved April 20, 2013. ^ Doninger 1999, p. 231. ^ Cross & Livingstone 2005, Crucifix. ^ Levine 2006, pp. 24–25. ^ Nickell, Joe (2007). Relics of the Christ. University Press of Kentucky. p. 191. ISBN 978-0-8131-3731-5. ^ Dillenberger 1999, p. 5. ^ Thurston, Herbert (1913). "Holy Nails" . In Herbermann, Charles. Catholic Encyclopedia. New York: Robert Appleton Company. ^ Delaney, Sarah (May 24, 2010). "Shroud exposition closes with more than 2 million visits". Catholic News Service. Archived from the original on June 8, 2010. ^ Wojtyła, Karol J. (May 24, 1998). "Pope John Paul II's address in Turin Cathedral". Vatican Publishing House. ^ Squires, Nick (May 3, 2010). "Pope Benedict says Shroud of Turin authentic burial robe of Jesus". Christian Science Monitor. Blomberg, Craig L. (2009). Jesus and the Gospels: An Introduction and Survey. B&H Publishing Group. ISBN 978-0-8054-4482-7. Boring, M. Eugene; Craddock, Fred B. (2004). The people's New Testament commentary. Westminster John Knox Press. ISBN 978-0-664-22754-8. Brown, Raymond E. (1988). The Gospel and Epistles of John: A Concise Commentary. Liturgical Press. ISBN 978-0-8146-1283-5. Brown, Raymond E. (1978). Mary in the New Testament. Paulist Press. ISBN 978-0-8091-2168-7. Carter, Warren (2003). Pontius Pilate: portraits of a Roman governor. Liturgical Press. ISBN 978-0-8146-5113-1. Chilton, Bruce; Evans, Craig A. (1998). Studying the Historical Jesus: Evaluations of the State of Current Research. Brill. ISBN 978-90-04-11142-4. Cox, Steven L.; Easley, Kendell H (2007). Harmony of the Gospels. B&H Publishing Group. ISBN 978-0-8054-9444-0. Cross, Frank L.; Livingstone, E.A., eds. (2005). Oxford Dictionary of the Christian Church. Oxford University Press. ISBN 978-0-19-280290-3. Crossan, John D.; Watts, Richard G. (1999). Who Is Jesus? : Answers to Your Questions About the Historical Jesus. Westminster John Knox Press. ISBN 978-0-664-25842-9. Dickson, John (2008). Jesus: A Short Life. Kregel Publications. ISBN 978-0-8254-7802-4. Dillenberger, John (1999). Images and Relics : Theological Perceptions and Visual Images in Sixteenth-Century Europe: Theological Perceptions and Visual Images in Sixteenth-Century Europe. Oxford University Press. ISBN 978-0-19-976146-3. Donahue, John R.; Harrington, Daniel J. (2002). The Gospel of Mark. Liturgical Press. ISBN 978-0-8146-5804-8. Doninger, Wendy (1999). Merriam-Webster's Encyclopedia of World Religions. Merriam-Webster. ISBN 978-0-87779-044-0. Dunn, James D.G. (2003). Jesus Remembered. Wm. B. Eerdmans Publishing. ISBN 978-0-8028-3931-2. Eddy, Paul R.; Boyd, Gregory A. (2007). The Jesus legend: a case for the historical reliability of the synoptic Jesus tradition. Baker Academic. ISBN 978-0-8010-3114-4. Ehrman, Bart (1999). Jesus: Apocalyptic Prophet of the New Millennium. Oxford University Press. ISBN 978-0-19-983943-8. Evans, Craig A. (2003). The Bible Knowledge Background Commentary: Matthew-Luke. David C. Cook. ISBN 978-0-7814-3868-1. Evans, Craig A. (2005). The Bible Knowledge Background Commentary: John's Gospel, Hebrews-Revelation. David C. Cook. ISBN 978-0-7814-4228-2. Evans, Craig A. (2012). Jesus and His World: The Archaeological Evidence. Westminster John Knox Press. ISBN 978-0-664-23413-3. France, R.T. (2007). The Gospel of Matthew. Wm. B. Eerdmans Publishing. ISBN 978-0-8028-2501-8. Freedman, David N. (2000). Eerdmans Dictionary of the Bible. Amsterdam University Press. ISBN 978-0-8028-2400-4. Green, Joel B.; McKnight, Scot; Marshall, I. Howard (1992). Dictionary of Jesus and the Gospels. InterVarsity Press. p. 442. ISBN 978-0-8308-1777-1. Grudem, Wayne (1994). Systematic Theology: An Introduction to Biblical Doctrine. Grand Rapids, MI: Zondervan. ISBN 978-0-310-28670-7. Houlden, J. Leslie (2006). Jesus: the complete guide. Continuum. ISBN 978-0-8264-8011-8. Köstenberger, Andreas J.; Kellum, L. Scott; Quarles, Charles L (2009). The Cradle, the Cross, and the Crown: An Introduction to the New Testament. B&H Publishing Group. ISBN 978-0-8054-4365-3. Lee, Dorothy A. (2004). Transfiguration. Continuum. ISBN 978-0-8264-7595-4. Levine, Amy-Jill (2006). "Introduction". In Levine, Amy-Jill; Allison, Dale C.; Crossan, John D. The Historical Jesus in Context. Princeton Univ Press. ISBN 978-0-691-00992-6. Licona, Michael R. (2010). The Resurrection of Jesus: A New Historiographical Approach. InterVarsity Press. ISBN 978-0-8308-2719-0. Maier, Paul L. (1989). "The Date of the Nativity and Chronology of Jesus". In Finegan, Jack; Vardaman, Jerry; Yamauchi, Edwin M. Chronos, kairos, Christos: nativity and chronological studies. Eisenbrauns. ISBN 978-0-931464-50-8. Majerník, Ján; Ponessa, Joseph; Manhardt, Laurie W. (2005). The Synoptics: Matthew, Mark, Luke. Emmaus Road Publishing. ISBN 978-1-931018-31-9. McGrath, Alister E. (2006). Christianity: An Introduction. John Wiley & Sons. pp. 4–6. ISBN 978-1-4051-0899-7. Meier, John P. (2006). "How do we decide what comes from Jesus". In Dunn, James D.G. ; McKnight, Scot. The Historical Jesus in Recent Research. Eisenbrauns. ISBN 978-1-57506-100-9. Mills, Watson E.; Bullard, Roger A. (1998). Mercer dictionary of the Bible. Mercer University Press. ISBN 978-0-86554-373-7. Morris, Leon (1992). The Gospel according to Matthew. Wm. B. Eerdmans Publishing. ISBN 978-0-85111-338-8. Niswonger, Richard L. (1992). New Testament History. Zondervan. ISBN 978-0-310-31201-7. Pannenberg, Wolfhart (1968). Jesus – God and Man. S.C.M. Press. ISBN 978-0-334-00783-8. Powell, Mark A. (1998). Jesus as a Figure in History: How Modern Historians View the Man from Galilee. Westminster John Knox Press. ISBN 978-0-664-25703-3. Rahner, Karl (2004). Encyclopedia of theology: a concise Sacramentum mundi. Continuum. ISBN 978-0-86012-006-3. Rausch, Thomas P. (2003). Who is Jesus? : an introduction to Christology. Liturgical Press. ISBN 978-0-8146-5078-3. Redford, Douglas (2007). The Life and Ministry of Jesus: The Gospels. Standard Publishing. ISBN 978-0-7847-1900-8. Reed, Jonathan L. (2002). Archaeology and the Galilean Jesus: a re-examination of the evidence. Continuum. ISBN 978-1-56338-394-6. Sanders, Ed P. (1993). The Historical Figure of Jesus. Allen Lane Penguin Press. ISBN 978-0-14-192822-7. Stanton, Graham (2002). The Gospels and Jesus. Oxford University Press. ISBN 978-0-521-00802-0. Theissen, Gerd; Merz, Annette (1998). The Historical Jesus : a Comprehensive Guide. Fortress Press. ISBN 978-1-4514-0863-8. Theissen, Gerd; Winter, Dagmar (2002). The Quest for the Plausible Jesus: The Question of Criteria. Westminster John Knox Press. ISBN 978-0-664-22537-7. Twelftree, Graham H. (1999). Jesus the miracle worker: a historical & theological study. InterVarsity Press. ISBN 978-0-8308-1596-8. Van Voorst, Robert E (2000). Jesus Outside the New Testament: An Introduction to the Ancient Evidence. Eerdmans Publishing. ISBN 978-0-8028-4368-5. Vine, William E. (1940). Expository Dictionary of New Testament Words. Fleming H. Revell Company. ISBN 978-0-916441-31-9. Vermes, Geza (1981). Jesus the Jew: A Historian's Reading of the Gospels. Philadelphia: First Fortress. ISBN 978-0-8006-1443-0. Vermes, Geza (2003). The Authentic Gospel of Jesus. London: Penguin. ISBN 978-0-14-100360-3. Walvoord, John F.; Zuck, Roy B. (1983). The Bible Knowledge Commentary: New Testament. David C. Cook. ISBN 978-0-88207-812-0. Wilson, Barrie A (2007). How Jesus Became Christian. New York: St.Martin's Press. ISBN 978-0-679-31493-6. Witherington, Ben (1997). The Jesus Quest: The Third Search for the Jew of Nazareth. InterVarsity Press. ISBN 978-0-8308-1544-9. Complete Sayings of Jesus Christ in parallel Latin and English. Christ the Lord Is Risen Again!